Android tablet gaming. New performance records, useful gaming features, and an integrated stylus are to take gaming on a tablet one step further. 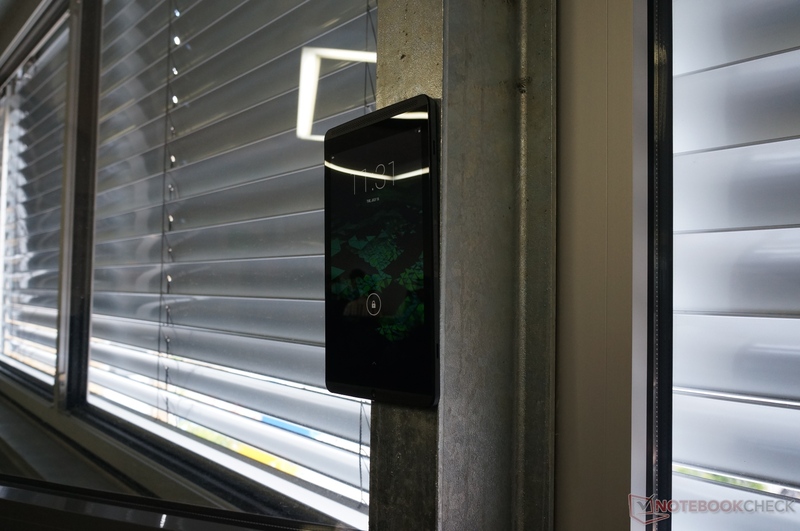 An attractive price of 299 Euros (~$387) fused with minor production flaws; the Shield tablet was quite convincing in our test. The Nvidia Shield tablet is currently available in two versions: A 16 GB version that we are testing here, and a 32 GB version with an LTE chip. 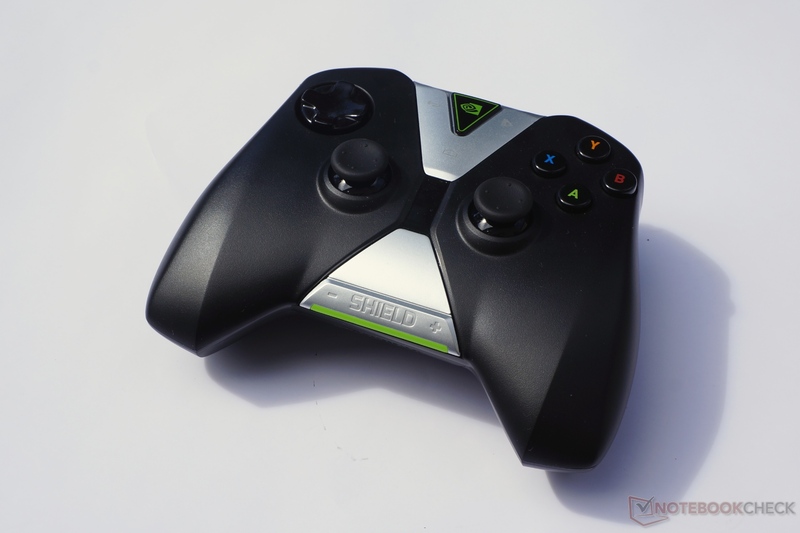 Both feature the brand new Nvidia Tegra K1 SoC with a 4+1 Cortex A15 processor and 2 GB of memory. 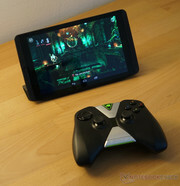 As a special feature, Nvidia offers GameStream support like in the Shield handheld in order to stream games from the home PC to the tablet or TV. An optional wireless controller is also available. An integrated stylus, like in the Tegra Note 7, and a 1920x1200 pixel, Full HD screen round off the bundle. 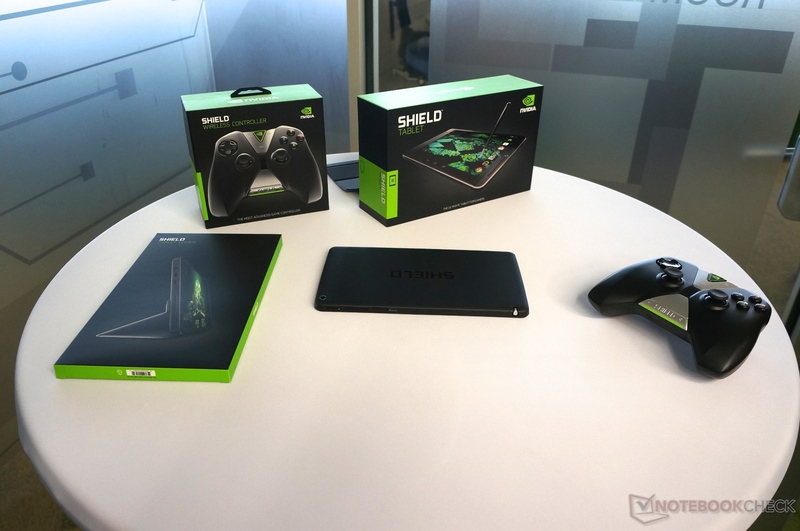 Nvidia's Shield tablet presents itself in a plain black design. Components, such as the beveled front edges or the two speakers beside the screen, remind us of contenders like from Apple (iPad Mini) or HTC (One series). 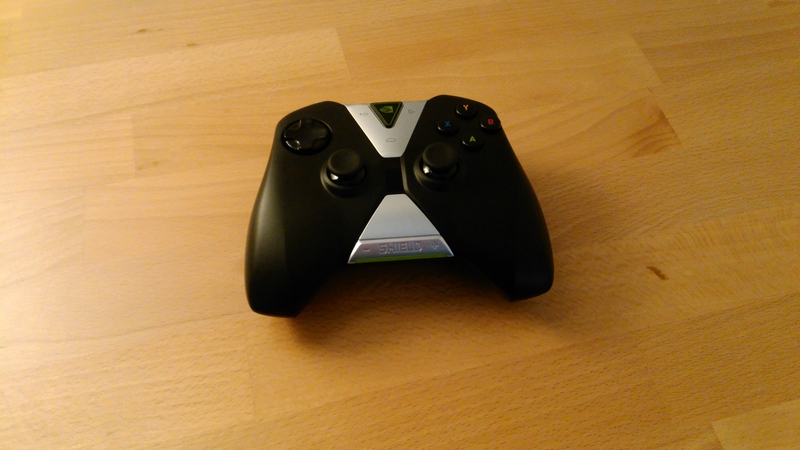 However, Nvidia extensively uses plastic in contrast to the mentioned rivals. 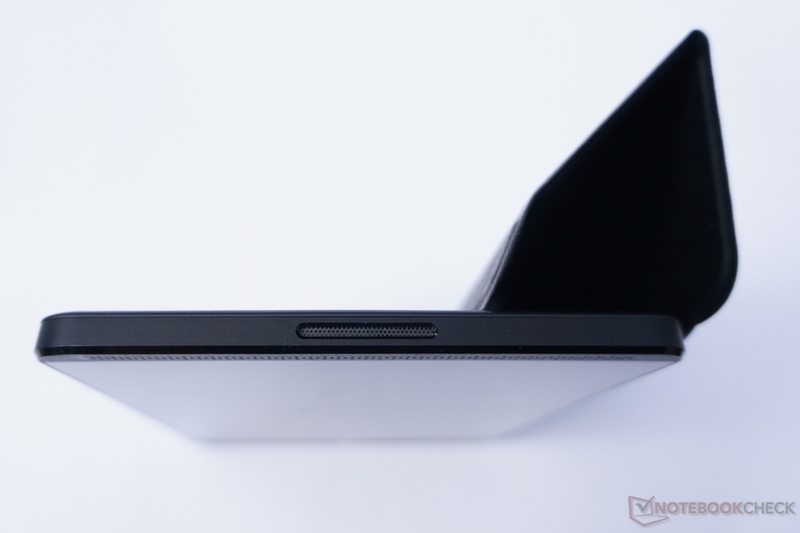 Beveled edges, large speakers, and a thick bezel around the glare screen dominate the Shield tablet's design. The material basically has a quality feel but is susceptible to scratches. 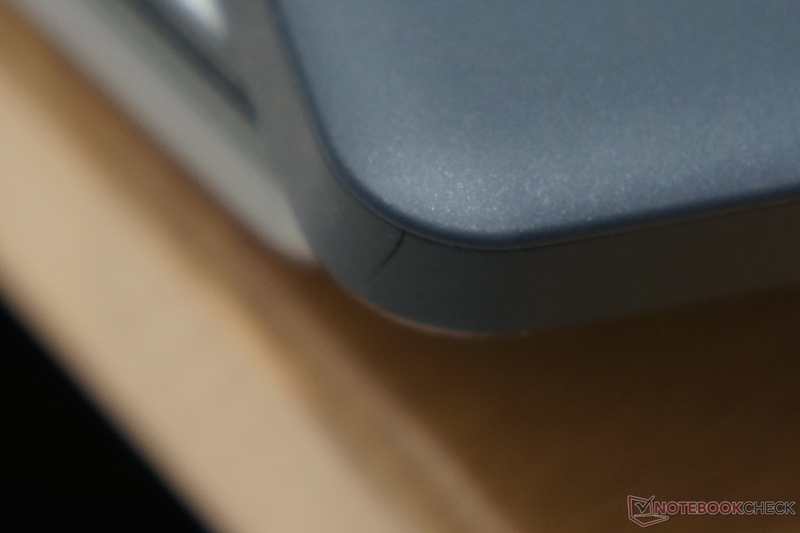 In particular, the plastic bezel around the casing is very prone to damage and already had visible scratches in the area of the USB port and two hairline cracks on the casing's edges in our press review sample. We also discovered a longer scratch on the screen that both stem from the previous usage of the review sample. Update: Nvidia told us that the cracks around the edge are a problem of the first production batch. They were fixed by introducing a gap on the corners (see image below). Crack on the casing's edge (first batch of devices). The newer models have a gap on the corner to prevent the cracks. Abrasions in and around the USB / charging port. The stiffness of our review sample was not ideal either. Minor warping or pressure on the screen was enough to cause slight color deviations on the TFT in those places. 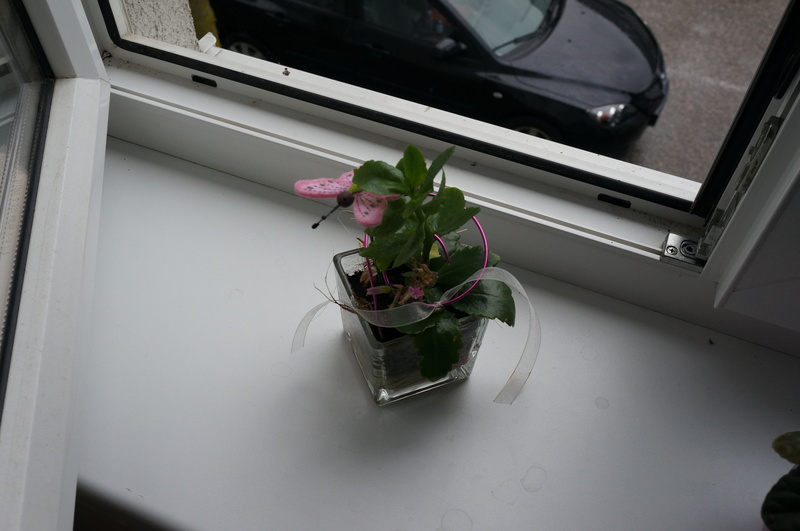 Besides that, we noticed that the back's mount was a bit shaky and that it did not close firmly everywhere. In a nutshell, Nvidia's low price point is definitely noticed in the casing. Although the materials feel good, they cannot compete with an iPad. 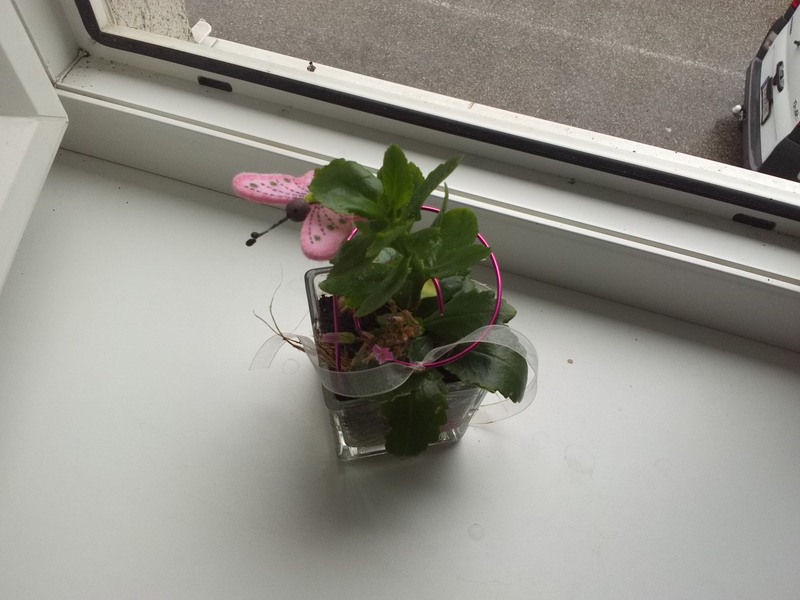 This is soon noticed in the signs of wear and tear, as well as in the form stability. Despite that, the tablet still makes an overall satisfactory impression. 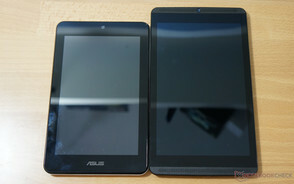 The low-priced Asus MemoPad 7-inch tablet is smaller, thicker, and thus stiffer. However, its back does not have such a quality feel. iPad Mini with Retina display premium contender: Clearly higher-quality and stiffer, but also pricier. 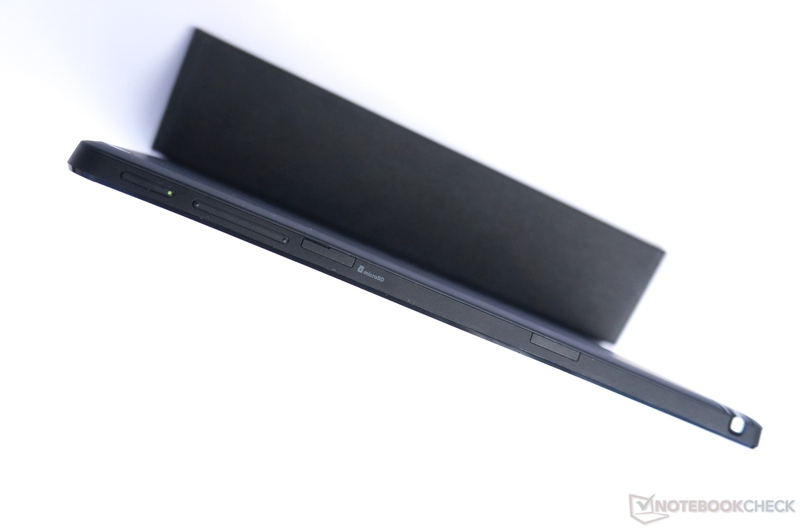 The iPad Mini is considerably thinner. 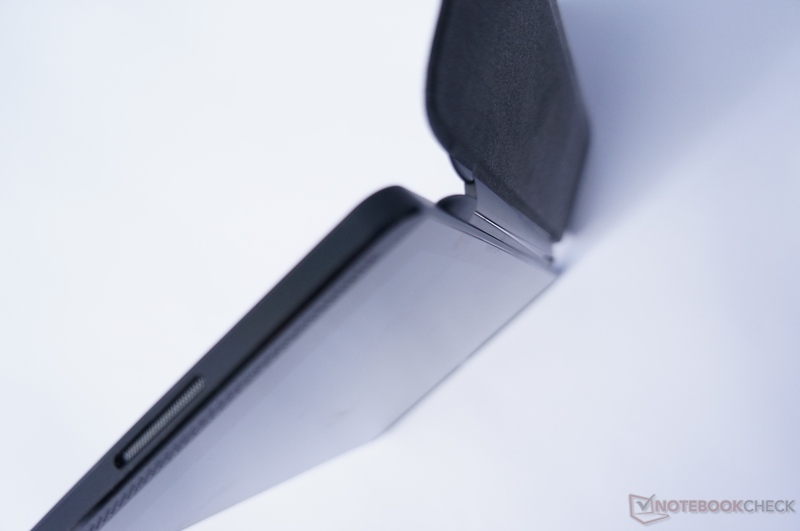 The back of the iPad Mini Retina: Higher-quailty but not as slip-proof. The installed interfaces are limited to the category's standard. 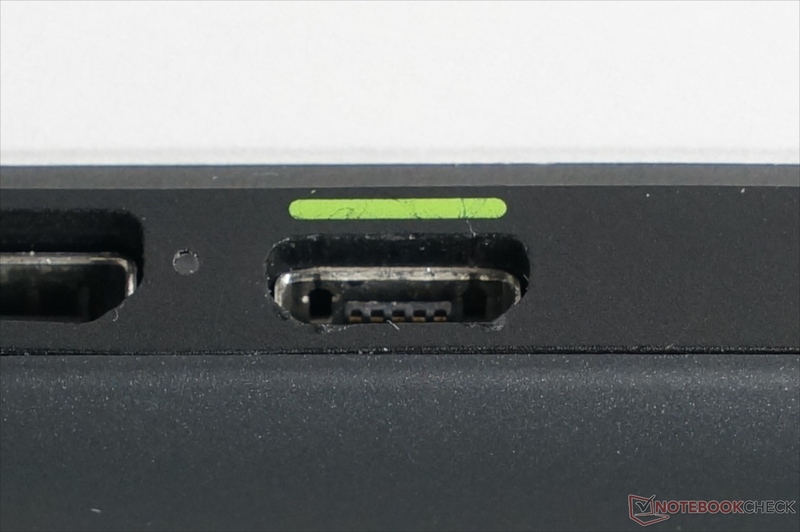 A micro-USB 2.0, mini-HDMI and headset port are all located on the tablet's upper edge. 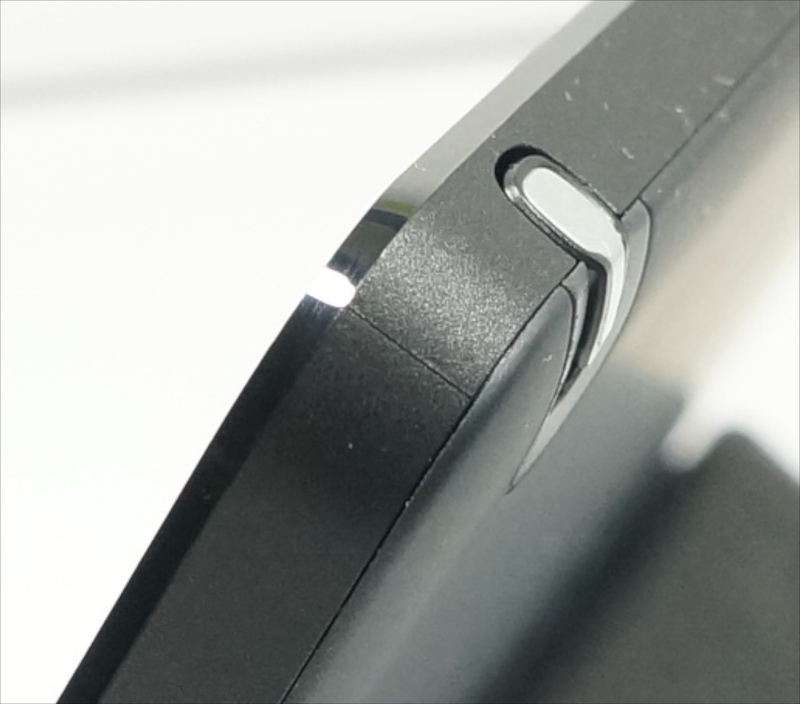 The micro-SD card slot is on the right beside the volume rocker. Unfortunately, it is submerged quite deeply and can only be taken out or inserted with a tool. The micro-USB port also supports USB OTG for connecting USB sticks and peripherals. Accessing files from a USB stick functioned without problems in the test, but the Adata SE720 USB 3.0 SSD was, however, not identified. 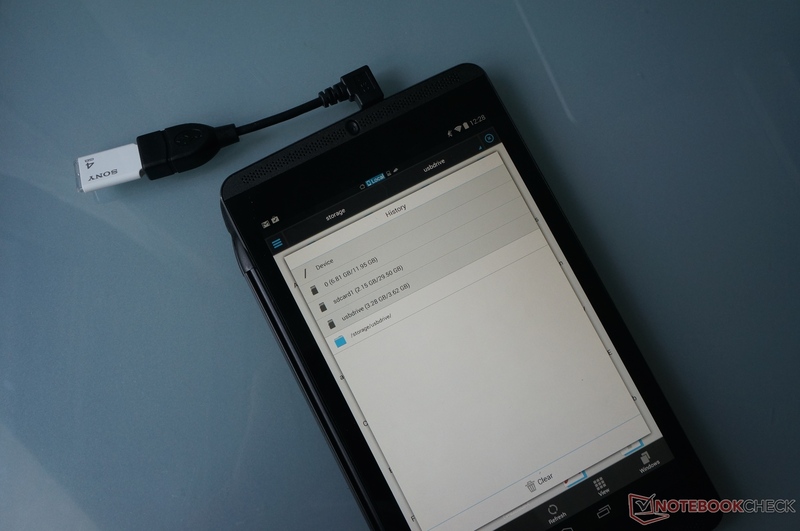 A cabled mouse and keyboard were also identified without problems and usable in Android. Headset jack, mini-HDMI and micro-USB port on the upper edge. Micro-SD card slot on the casing's side. LTE is only available in the 32 GB version of the Shield tablet. According to Nvidia, it is the same Icera LTE chip that is used in the Tegra Note 7 LTE. Nvidia states that the integrated Wi-Fi chip is identical with the one in the Shield console, and it is thus likely an AzureWave AW-AH691 2x2:2 MIMO 802.11 a/b/g/n Wi-Fi module that supports both 2.4 and 5 GHz. Unfortunately, it does not support the newest AC Wi-Fi standard. Consequently, the reception during our test was comparable with that of the Shield Portable, and thus better than, for example, with a Nexus 4. Acer's Liquid S2 with a Qualcomm Snapdragon 800 presented a considerably better performance though. 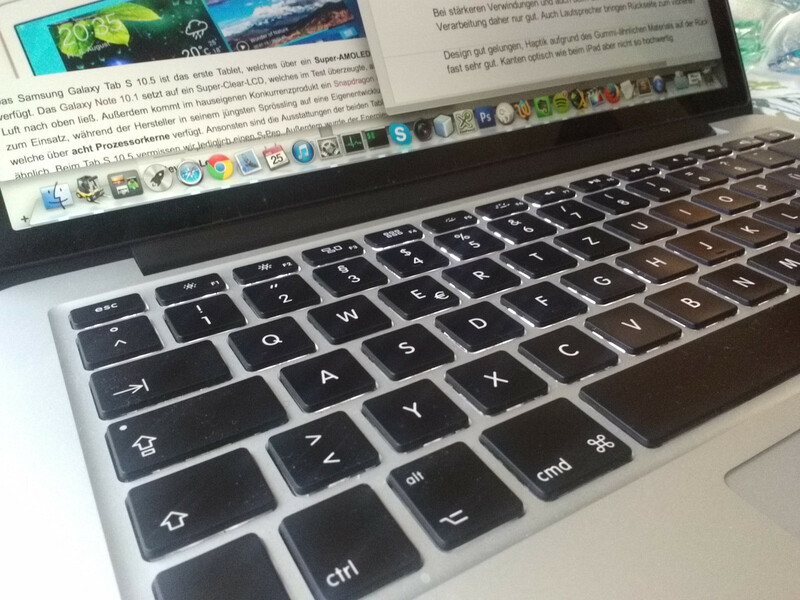 Apple's MacBook Pro 13 Retina Late 2013 with an AC Wi-Fi card remains unrivaled here. We tested this using iPerf and an Asus RT-AC68U router / Schenker S413 via LAN as the host. The installed GPS / GLONASS module found the first satellites quite soon. An initial connection, however, often took several minutes. 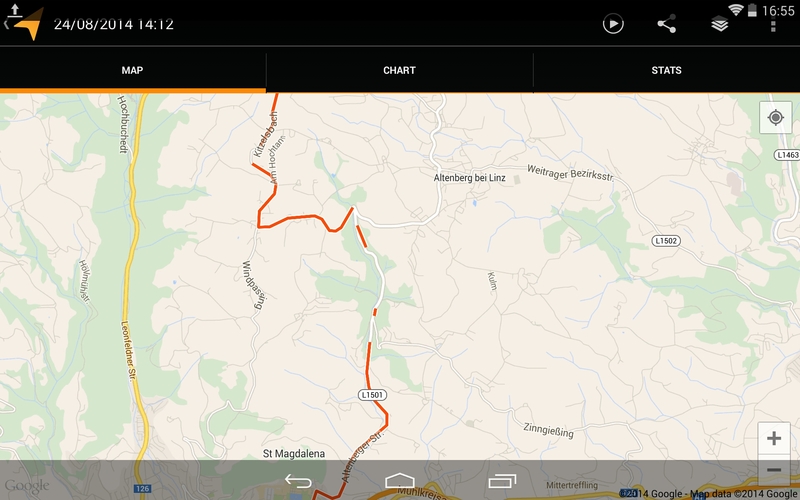 After that, tracking on a test route with a bike and car functioned well, but the connection was interrupted while driving through the woods. 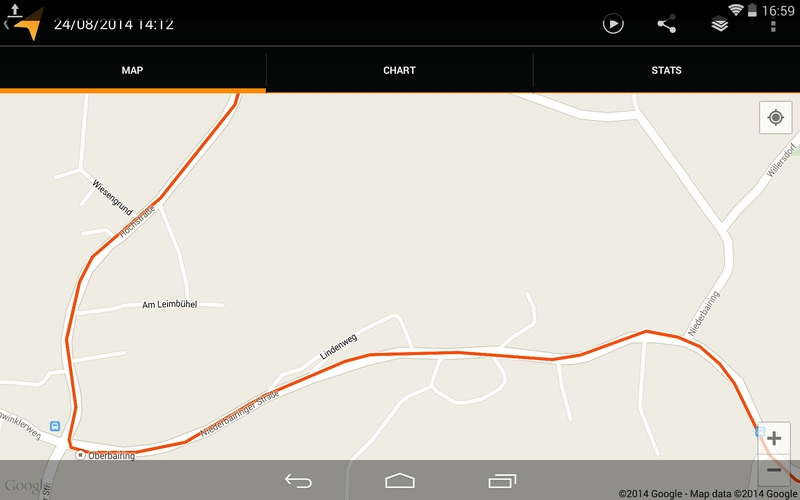 Test tracking using "My Tracks" in the car; evident interruption in the woods. Good detail accuracy when on a road. 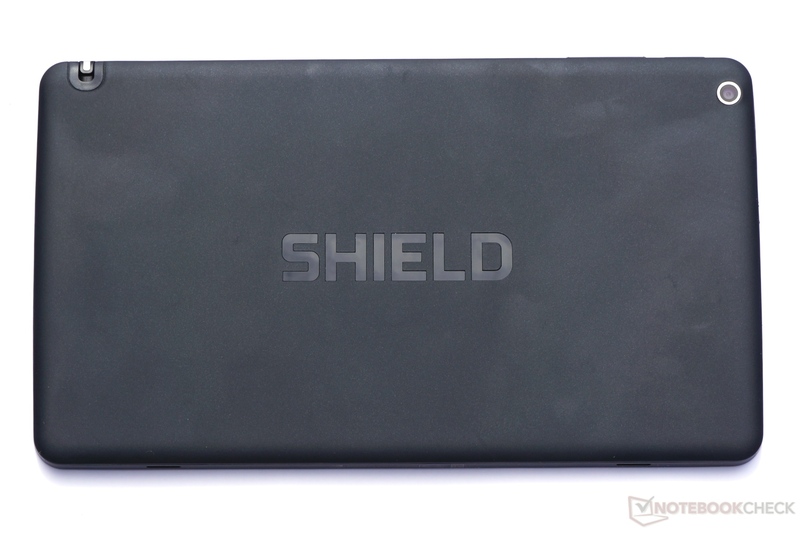 Only a small instruction booklet and the USB charger (maximum ascertained performance in charging and operation: 5.7 watts) are in the Shield tablet's box. We also found the Shield controller, Shield cover, and a mini-HDMI-to-HDMI cable in our test set. 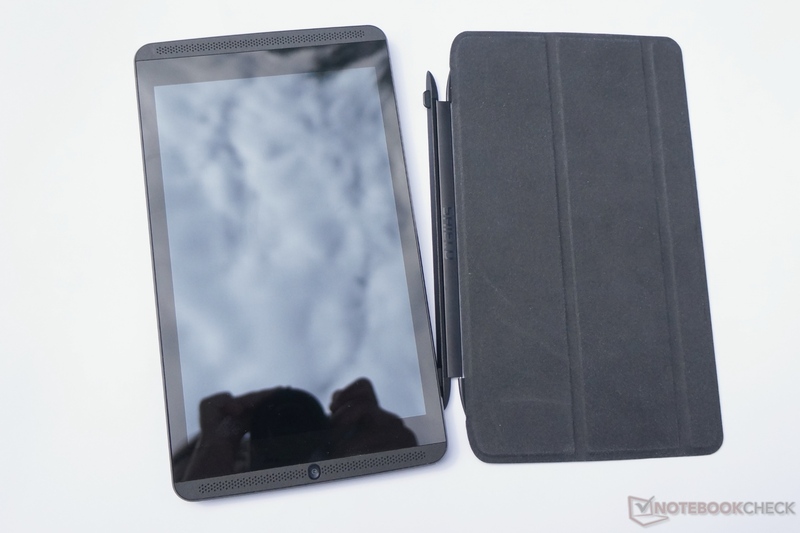 The Shield cover is attached to the tablet with magnets, using Apple as an example. 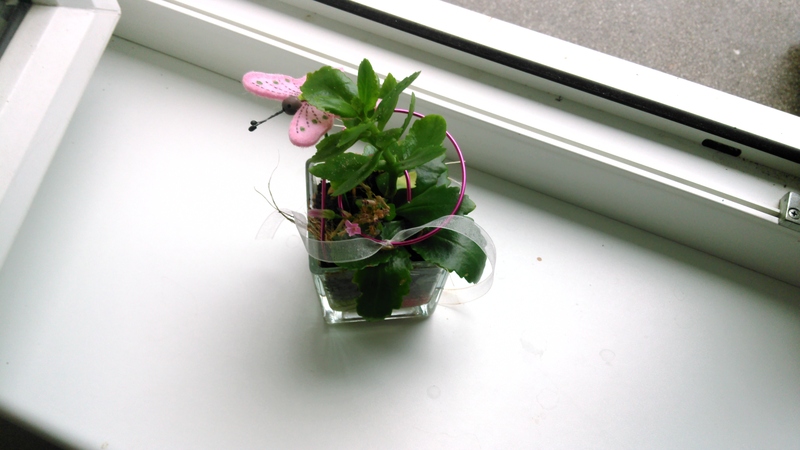 However, it has two recesses that interlock for a better hold. 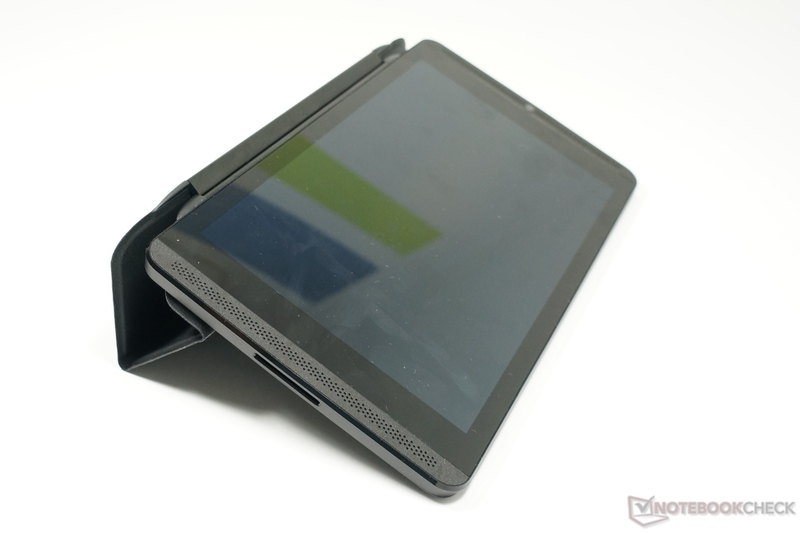 It has two different locking positions, and the option of waking up the tablet when it is opened. The upgrade and maintenance options are limited to the installed SD-card slot that supports SD cards with up to 128 GB according to Nvidia. A Samsung 64 GB Class 10 SD card functioned flawlessly in the test, and transmitted a 3.87 GB video file in 2 minutes and 32 seconds to the internal storage. This equals 20 MB per second, whereby the display ranged from 10 to 40 MB/s. 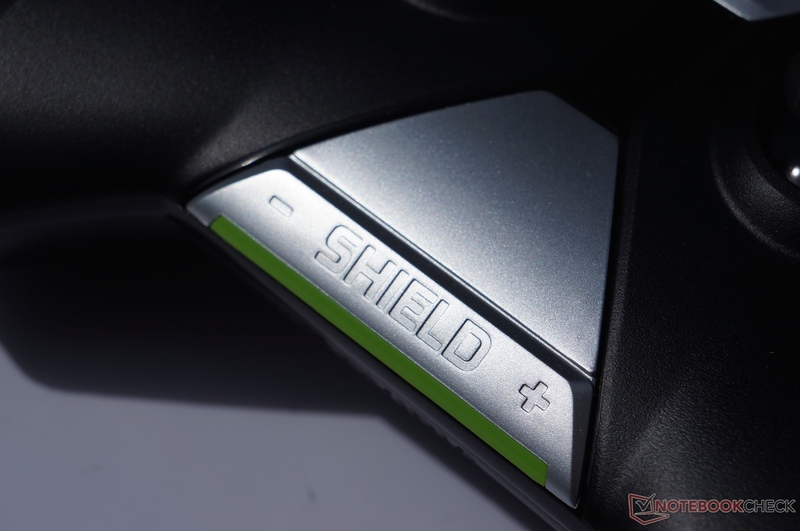 Nvidia includes a one-year manufacturer's warranty on its Shield. The first of the Shield cover's two positions. The second, somewhat more slanted option of the cover. 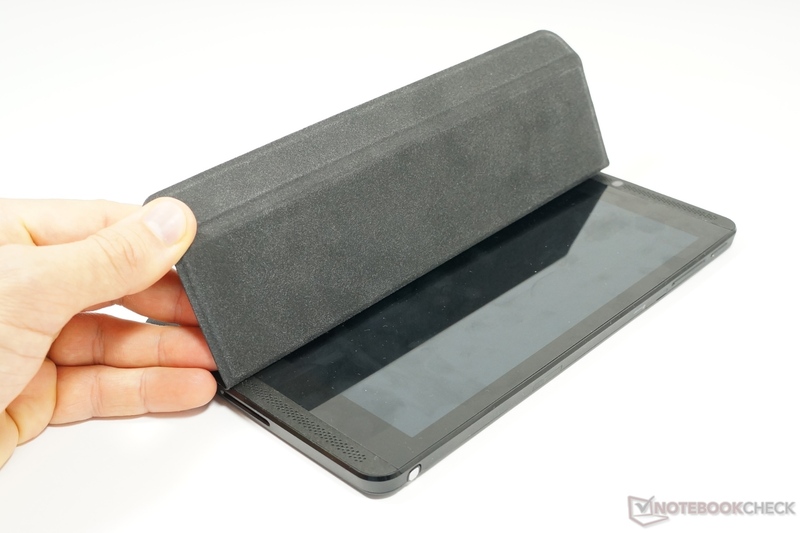 The cover also holds the tablet when lying. Using Apple's example, opening is detected and is used for locking/unlocking. The Shield tablet has two 5-megapixel cameras. Compared with the Tegra Note 7, the front-facing camera has been improved considerably and is very appealing for its intended application field like Twitch. 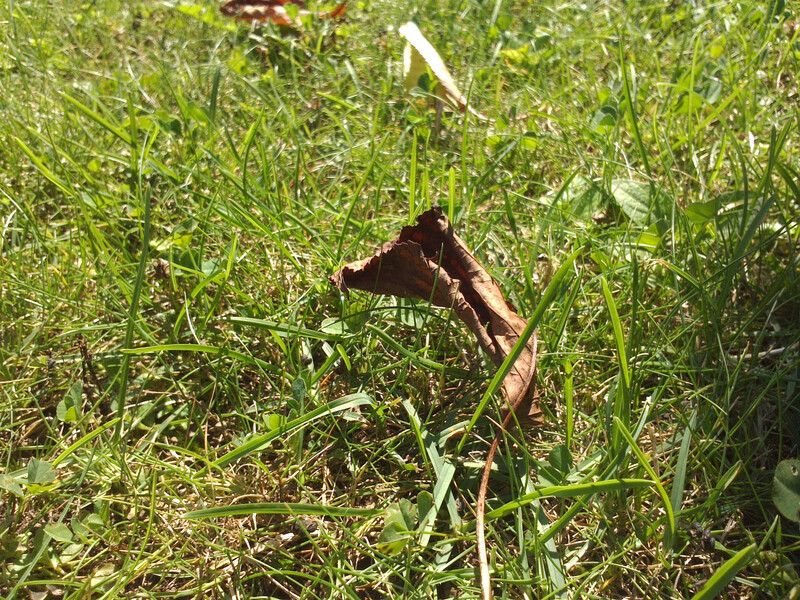 The rear-facing camera is not particularly convincing, and its color balance sometimes slightly deviates. 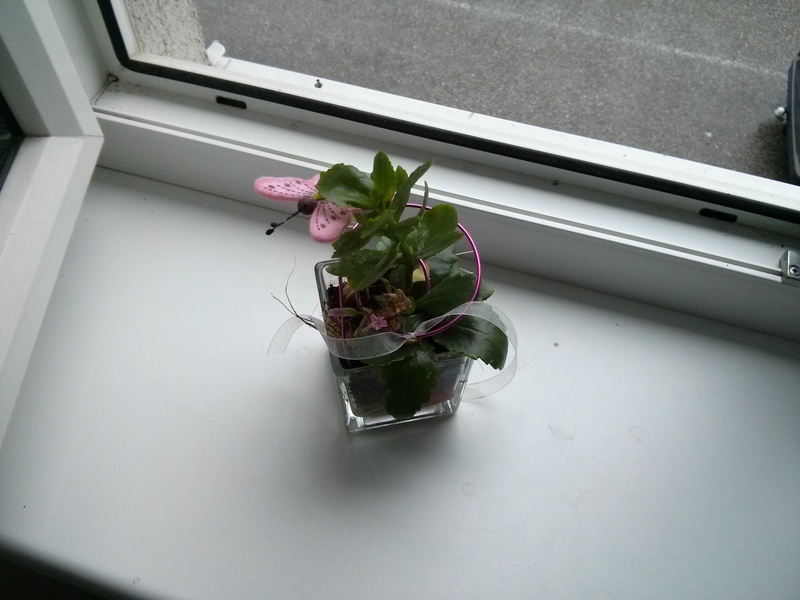 The camera is basically average but is sufficient for taking quick snapshots with the tablet. Nvidia uses the stock keyboard from Android 4.4 KitKat as its on-screen keyboard. However, an additional feature is the handwriting recognition that can be switched on. It functions sufficiently well with block letters, but handwriting hardly worked at all. Unfortunately, the installed hardware buttons have to be criticized. The power button and volume rocker are not particularly comfortable to use and are difficult to trigger because they are inserted too deeply. The multi-touchscreen detected all 10 fingers in the test and impressed with its accurate and smooth use. Unlike the Shield handheld, there are no distracting patterns visible on the screen. 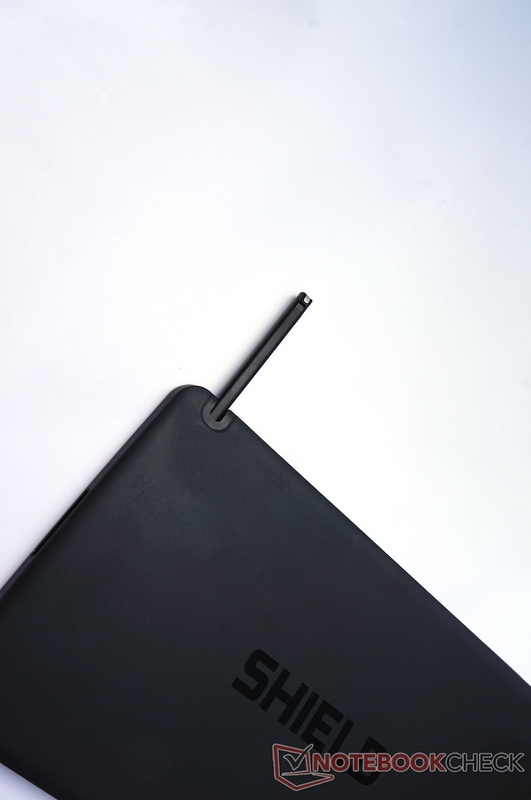 The integrated, capacitive stylus pleases with its good haptics and accuracy. The latency is also acceptable, and when finger recognition is disabled, it is possible to comfortably draw and write with it. The preloaded app "Nvidia Dabbler" illustrates the pen's possibilities well. Particularly, painting with "watercolors" and "oil" was quite impressive. 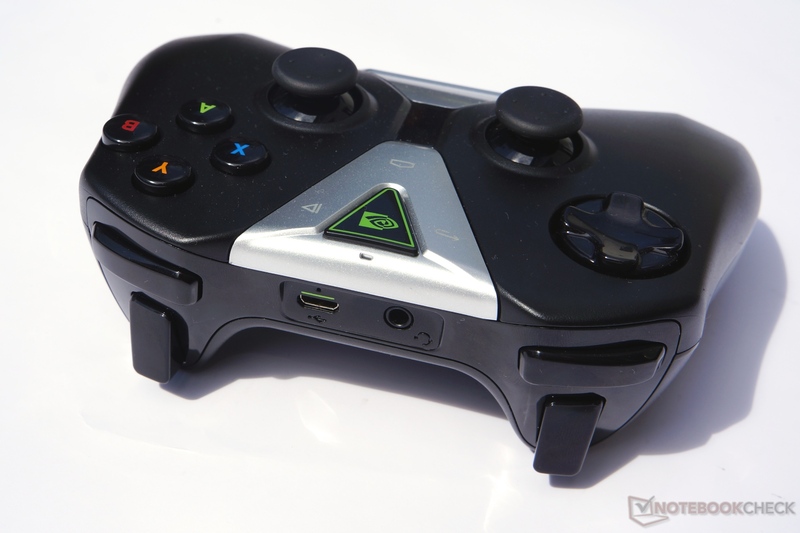 Nvidia optionally has a wireless gamepad in its line for 60 Dollars. 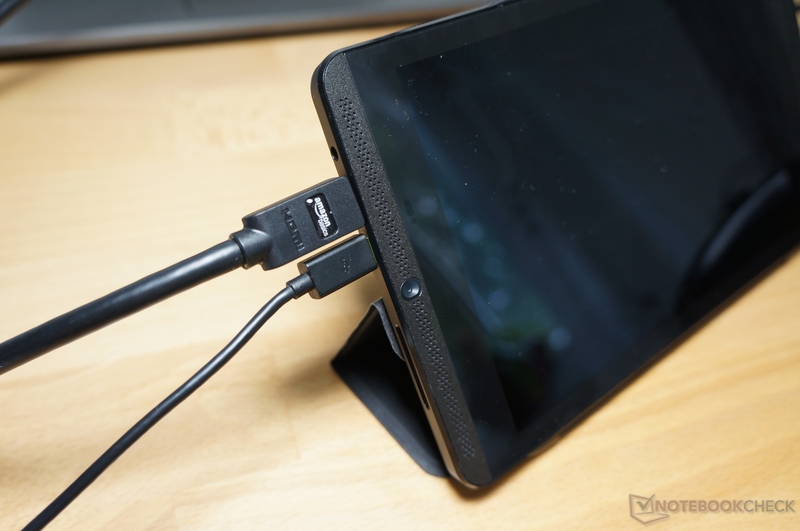 It can connect to the Shield tablet or the Shield console via a proprietary Wi-Fi Direct connection. The controller is recharged with a USB cable. 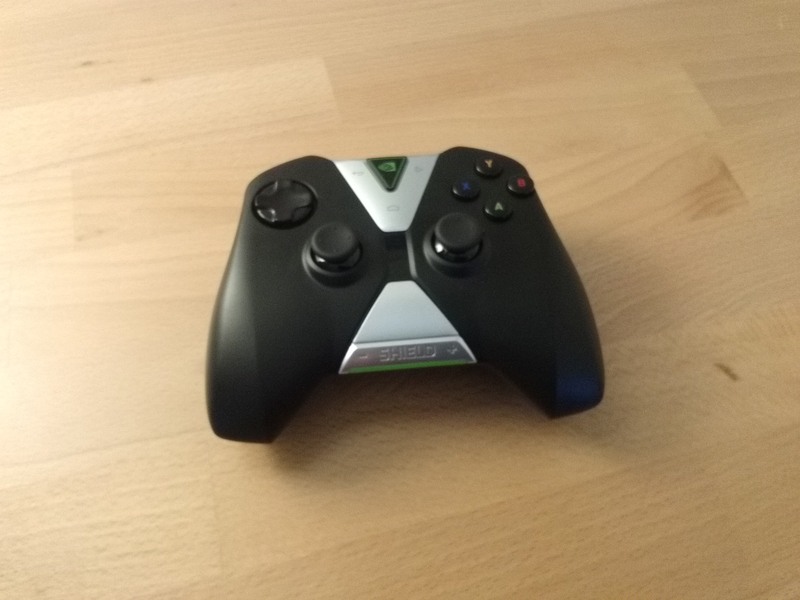 According to Nvidia, it can also connect directly with the Shield tablet. The gamepad provides a number of additional features. 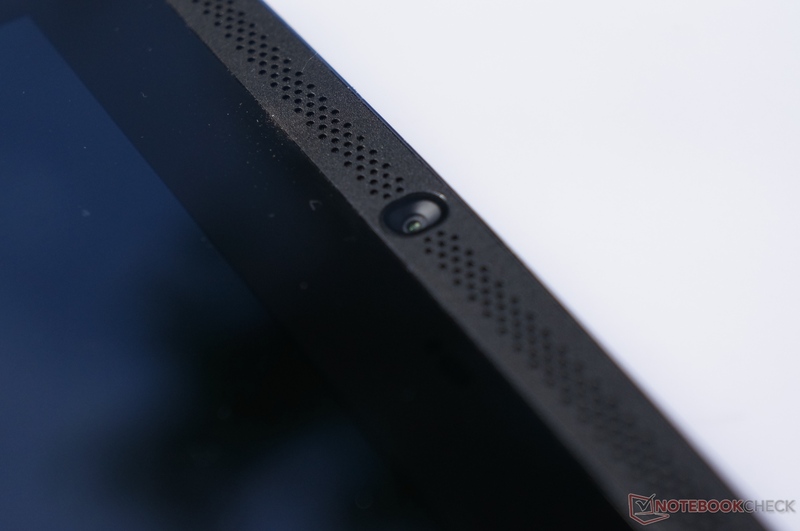 In addition to a microphone and headset jack, a small, trapezoid-shaped touchpad is in the lower area. However, this ClickPad was not convincing in the test and should only be used as a last resort, for example, to quickly adjust settings in the menus of some games. The controller is identified as a USB input device on the PC, but only the small touchpad responds and did not function flawlessly in the test. According to Nvidia this may change in future updates of GeForce Experience and we also saw a preview of a fully running controller in Windows. 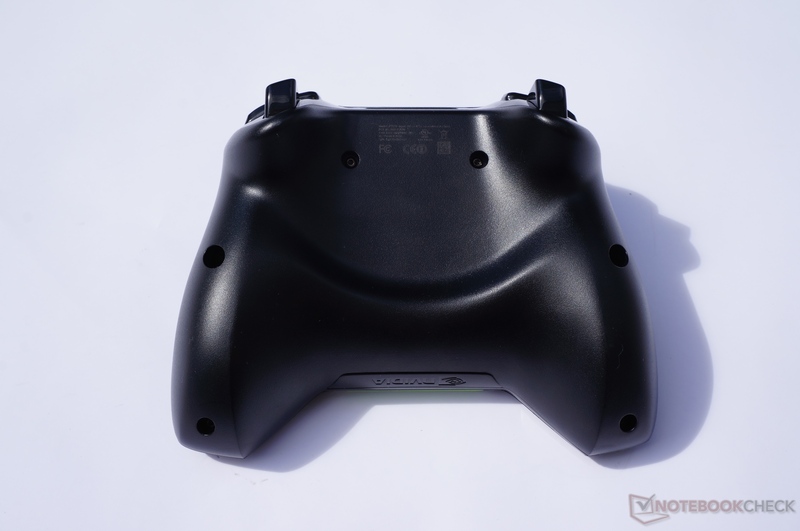 The gamepad is generally pleasant to hold and can be used over a longer time without fatigue. 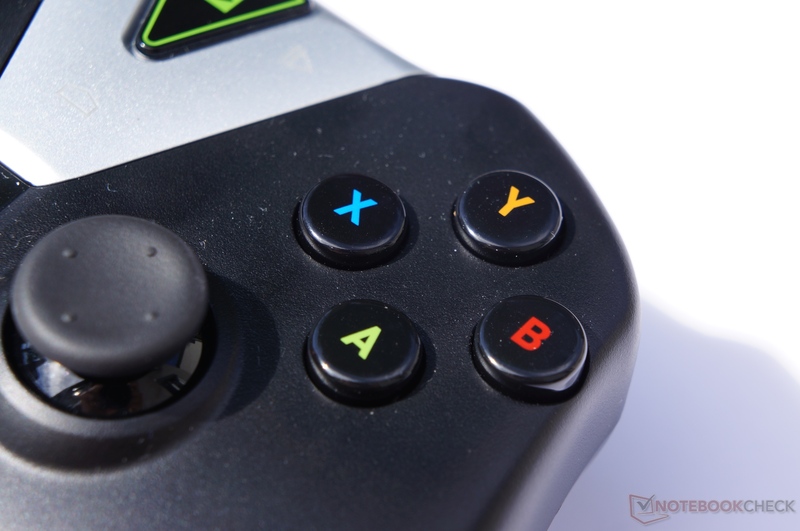 The analog joysticks, buttons, and in particular the digital joystick do not quite match the quality of current gamepads from Sony (PS3 and PS4) or Microsoft (Xbox). 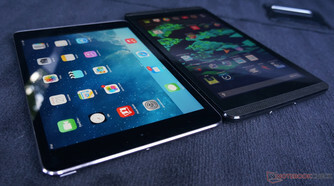 The installed 8-inch screen has a resolution of 1920x1200 pixels (283 ppi) and is a clear advancement compared with the 1280x800 pixels of the Tegra Note 7. Nvidia has two color options in the Shield tablet's settings: native that apparently does not adapt the colors, and a setting pre-calibrated to sRGB that is also enabled by default. We measured a slightly higher maximum brightness (455 vs. 408 cd/m² in the center) and maximum contrast (670:1 vs. 600:1) in native mode. Thus, the contrast slightly lags behind the average (800:1) of the last few tablets that we tested. Even the Shield console achieved a better rate with 1440:1 here. The ascertained illumination of 92% is outstanding. However, a slight light bleeding of the surrounding LED backlight can be seen in dark environments. A very obvious difference is seen between the two settings in the grayscale. The native setting reaches a higher maximum brightness. However, the grayscale is clearly shifted from the ideal rate and shows a visible cyan cast (red is lowered). 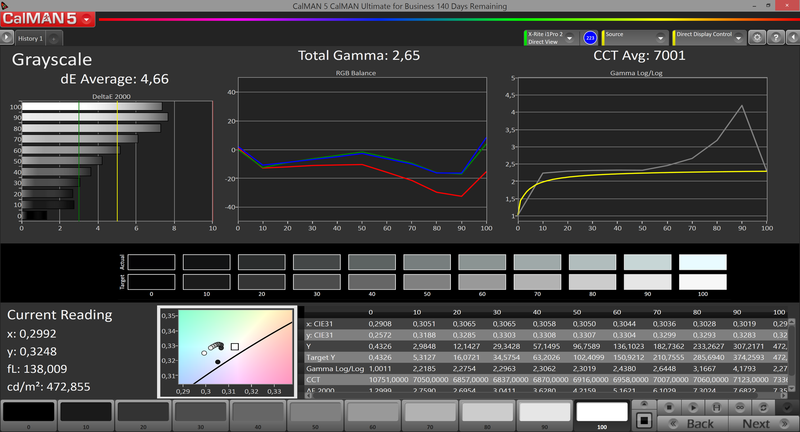 The DeltaE rate is much better in sRGB mode, and the gray rates remain neutral. The lighter the grayscale, the higher the shift from the ideal rate is (too dark). Nevertheless, the achieved DeltaE 2000 average of 3.4 is significantly better than the average accomplished by most tested tablets (5.3) and is located in the upper third. 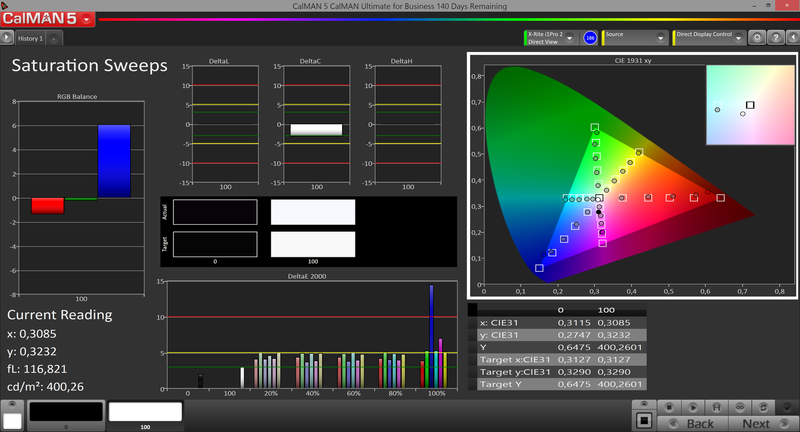 The sRGB setting clearly scores in the ColorChecker test. 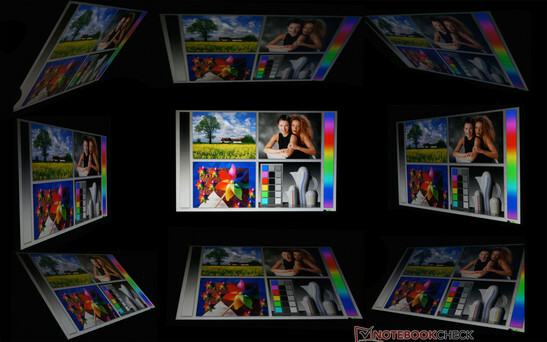 The colors are very close to the ideal, and they usually cannot be differentiated. 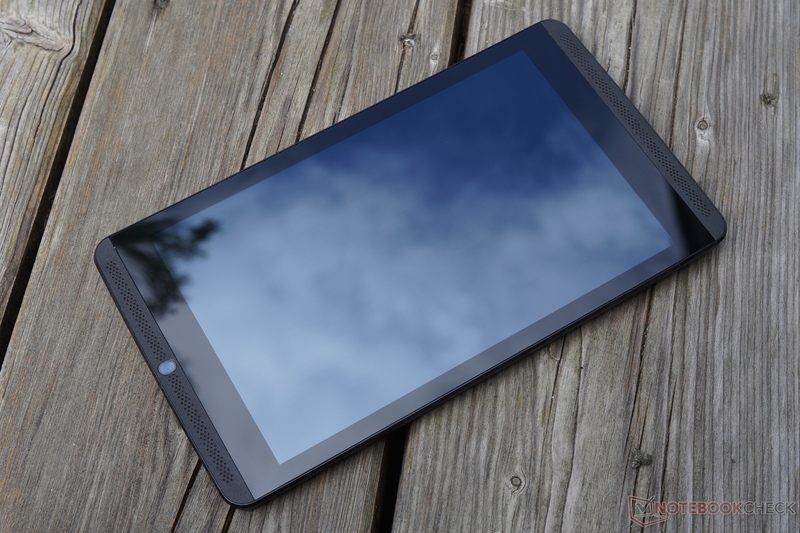 The average measured DeltaE2000 of 3.88 is in the top field of the tablets that we have assessed, and it is just behind the iPad Mini Retina with 3.32. However, Saturation Sweeps makes the biggest drawback of the 8-inch screen obvious. The coverage of the maximum reproducible color space is clearly limited at the lower axis. Consequently, the red and blue rates are clearly scaled (native) or cut off (sRGB mode). 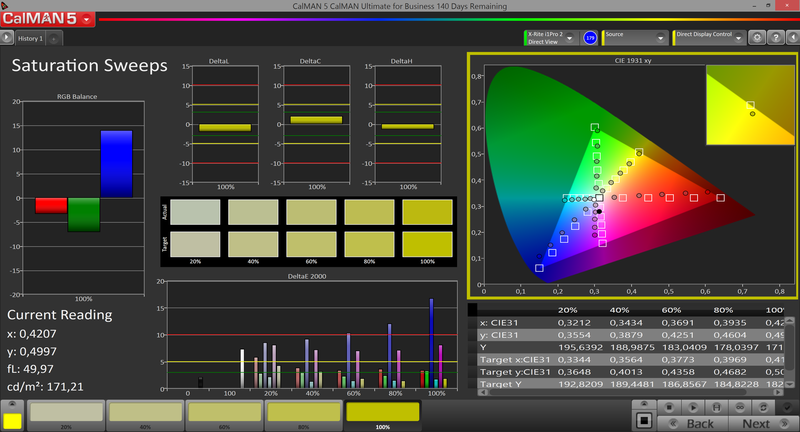 The screen particularly has problems displaying the maximum color rate in magenta (identical to the 80%-rate). The human eye will primarily notice the maximum blue rate that achieves a DeltaE of almost 15. Grayscale-sRGB - good, but light grayscales are a bit too dark. Grayscale native - cyan color cast. 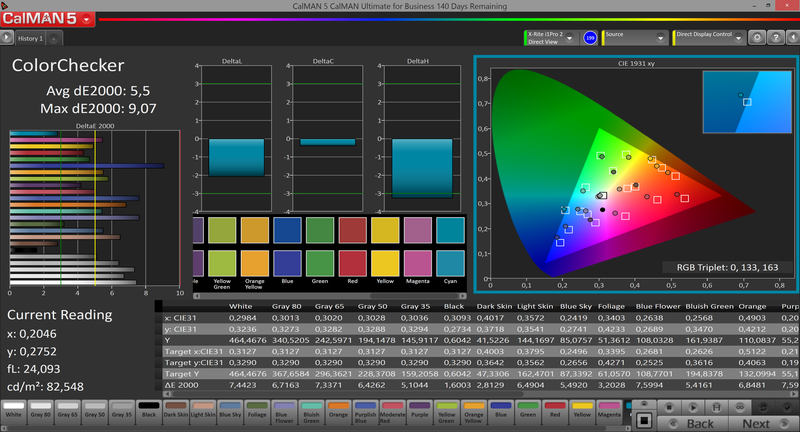 ColorChecker sRGB -very good accuracy in the color tests. ColorChecker native - clear shifts. 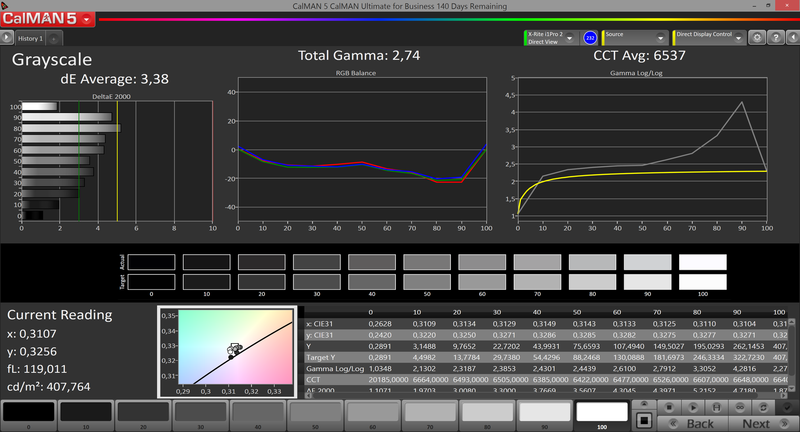 Saturation Sweeps sRGB - Calibration weaknesses become apparent; the blue-red axis is cut off. Saturation Sweeps native - scaled colors lead to some clear shifts, but with the same color intervals. The outstanding maximum brightness struggles with the touchscreen's reflective surface in outdoor use. 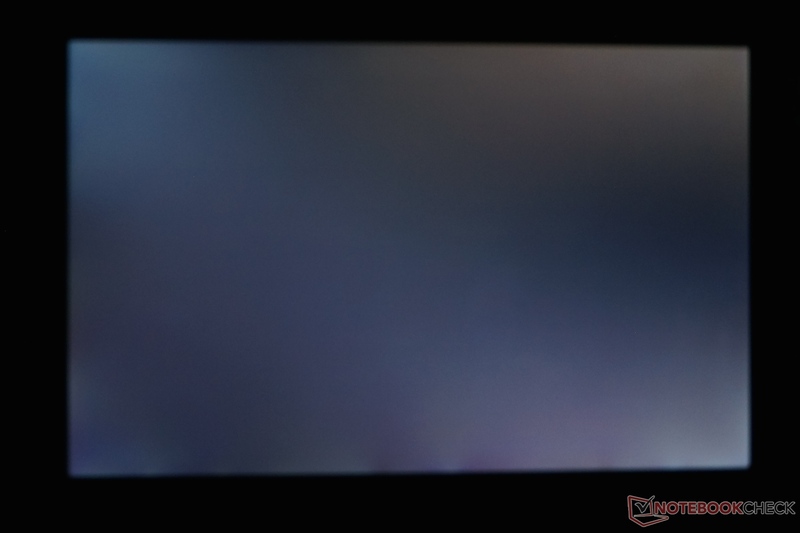 Light clouding is visible on a black screen in dark surroundings. The high brightness struggles with reflections in bright sunlight, but content can still be recognized. 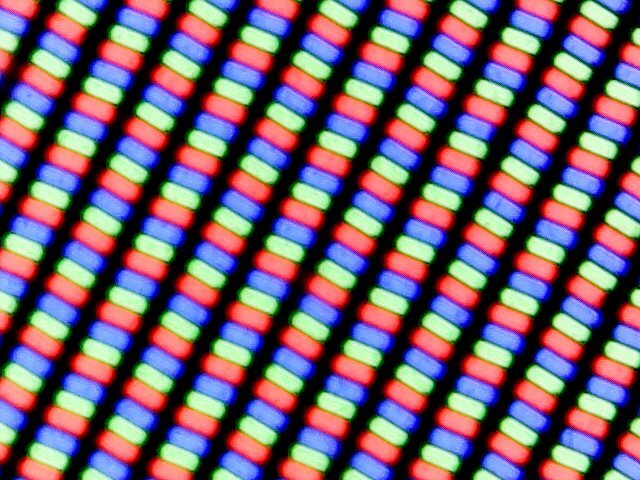 RGB pixel structure under a microscope. The colors remain stable, even in extreme viewing angles, owing to the underlying IPS technology. The IPS screen ensures stable colors from all viewing angles on the tablet. 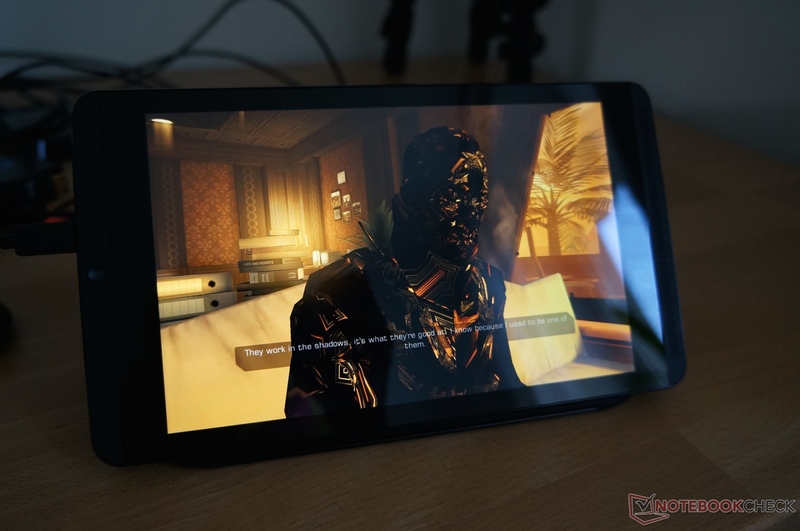 The main focus in a gaming tablet is naturally on performance. Nvidia relies on its brand new Tegra K1 SoC with 2 GB of RAM and 16 GB of NAND flash storage. The quad-core Tegra K1 has not been modified much on the processor side. In contrast to the Tegra 4, a newer revision (r3) of the ARM Cortex A15 is used. That, alongside the 28 nm HPM process, increased the maximum clock rate from 1.9 to 2.3 GHz. Further information about the improved efficiency and the 5th processor core for energy saving purposes can be found on the Tegra K1 SoC page. Compared with the contenders, the Cortex A15 cores are quite impressive. The Snapdragon 800, 801 and Atom Z3745 are averagely 30% slower (but partly in thermally limited smartphones). The Tegra K1 is only sometimes marginally defeated in the PassMark CPU test, and the highly fluctuating Linpack Multi-Thread test. We do not have as many benchmark scores for comparison for the brand new, and not yet tested by us, Snapdragon 805 and Apple A7 in the latest iPad. The 805 remains behind the K1 in the few benchmarks and the A7 can primarily score in single-thread performance. However, the 64-bit Tegra K1 version is to compete against it soon. The Shield tablet shows its strengths in the browser benchmarks. The tablet is among the leaders iPad Air, Snapdragon 801, and Tegra 4 in all tests. It is, for example, the fastest tested tablet in the Google Octane v2 benchmark. It reaches 7th and 9th place (depending on the browser) in the SunSpider benchmark, and 3rd place in WebXPRT. The Tegra K1 can again score in the synthetic system benchmarks. The contenders only beat the Shield tablet in the system test of BaseMark OS II. The swift Qualcomm Snapdragon 801 in LG's G3 is a remarkable 31% slower than the K1 on average. The 16 GB internal flash storage presents an above average performance in our benchmarks. However, the performance is not outstanding compared with the premium contenders and in particular the exceptional G3. 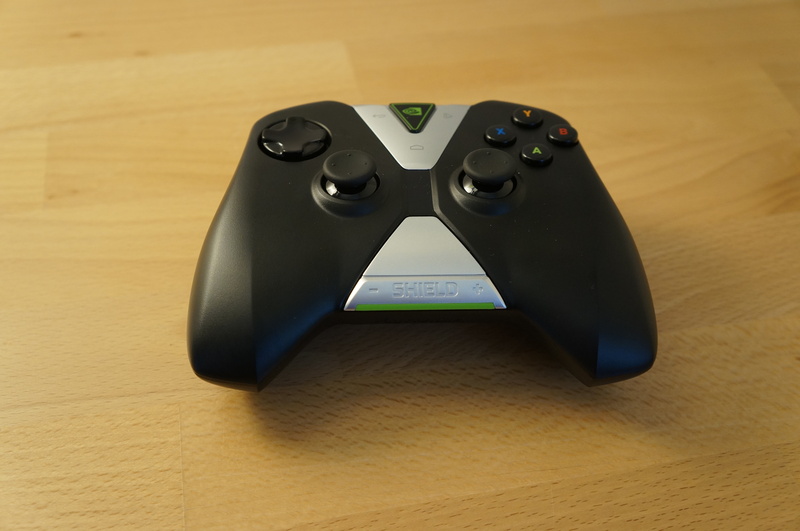 Nevertheless, considerable improvements are visible when compared with the Shield handheld based on Tegra 4. A highlight of the Tegra K1 SoC is the integrated Kepler graphics card. The architecture is known from laptops (e.g. GeForce 840M) and has not been cropped. However, Nvidia only installs one SMX unit (two in the 840M) with 192 shaders to keep the power consumption within limits. Further details about the graphics card can be found on our Tegra K1 Kepler GPU graphics card page. The Kepler graphics card can show its advantages in the synthetic graphics benchmarks. The premium contenders, such as the Adreno 330 (Snapdragon 800, 801), Adreno 420 (Snapdragon 805), PowerVR G64xx (Apple A7, Atom Z3460), and ARM Mali T628MP6 (Samsung Exynos 5420), are clearly outperformed by comparison. However, higher-resolution tablets are at a disadvantage in benchmarks that are performed directly on the screen in the native resolution (Basemark X, Anomaly 2). Unfortunately, it is a bit difficult to measure the gaming performance of Android. The games often have a fixed frame rate of 30 fps, adjust the settings according to the detected device automatically, run in different resolutions (native 1920x1200 pixels on the Shield tablet or 1920x1080 in console mode, up to 2560x1440 pixels in LG's G3), and they have random levels that are difficult to benchmark. Consequently, the Tegra K1 did not always show the expected performance that was seen in the theoretical benchmarks. 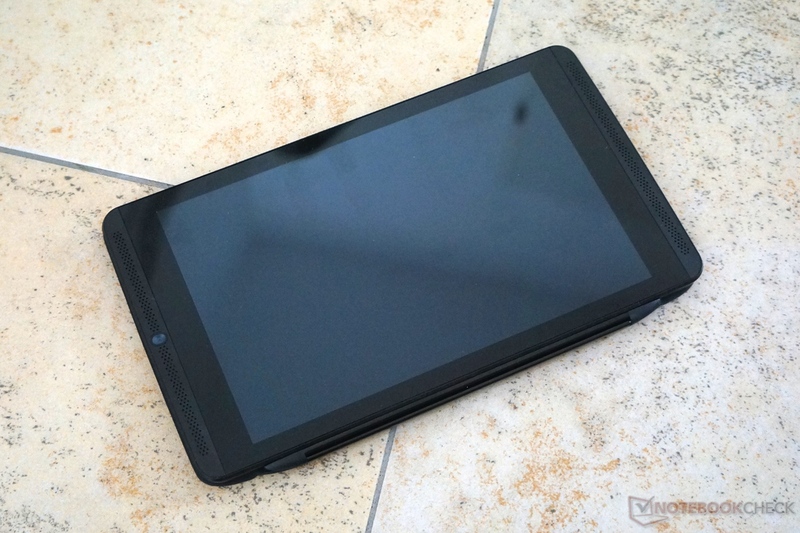 The Shield tablet reached the expected distances to the competitors in Dead Trigger 2 and GTA 3. 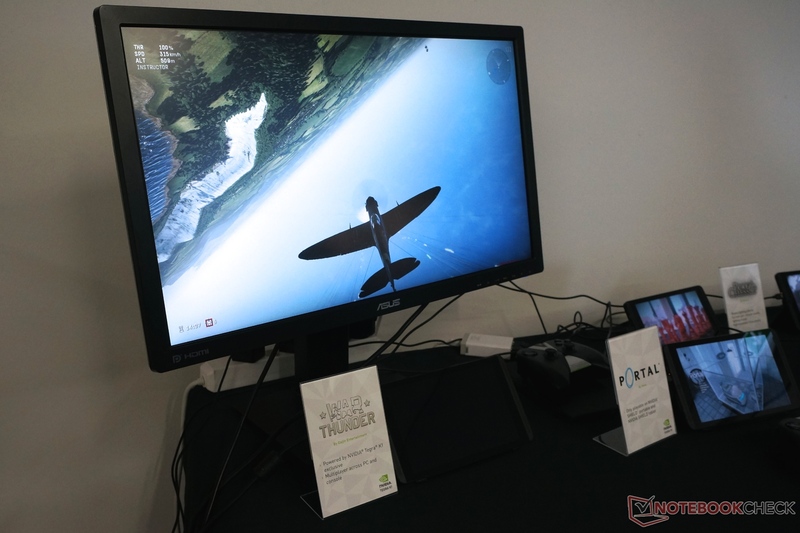 The SoC achieved over 50 fps in both games, and could clearly surpass contenders like the Nexus 5, LG G3 (both Adreno 330) or the Shield convertible (Tegra 4) (only about 30 fps). The Shield tablet only rendered the exact same frames per second as the Shield handheld in Real Racing 3, but the detail levels are set automatically and might thus differ. The K1 even lags behind the Adreno 330 in FIFA 14 because Nvidia's products (Tegra 4 and K1) are limited to a maximum of 25 fps in this game. So, the K1 generally cannot retrieve its full performance in real-life use (yet?). Nevertheless, all games could be played smoothly. We only noticed graphics errors in Deus Ex: The Fall, which became unsightly due to incorrect character textures. 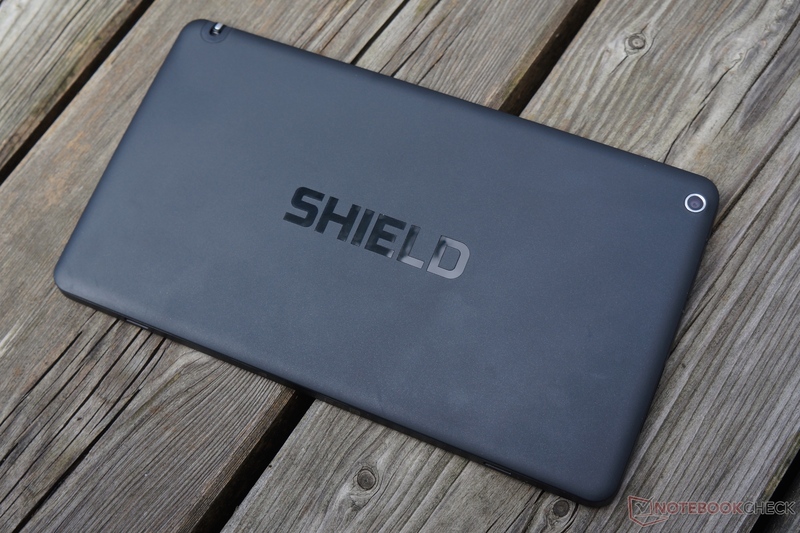 According to Nvidia that problem is not happening on other Shield Tablets, so perhaps our review unit had a problem there. Since the Tegra K1 is relatively new on the market, this situation could still improve considerably when the app developers adapt their games for the K1. In addition to the comparable standard apps, we also benchmarked the included Trine 2 and the optionally available Portal. Both ran with roughly 29 frames per second using 1920x1200 pixels (maximum: 30). Trine was very stable and usually remained between 27 and 30 fps. Portal fluctuated strongly at 24 fps. Like the Shield portable, the Shield tablet supports GameStream, Console Mode, and GRID (still USA only). 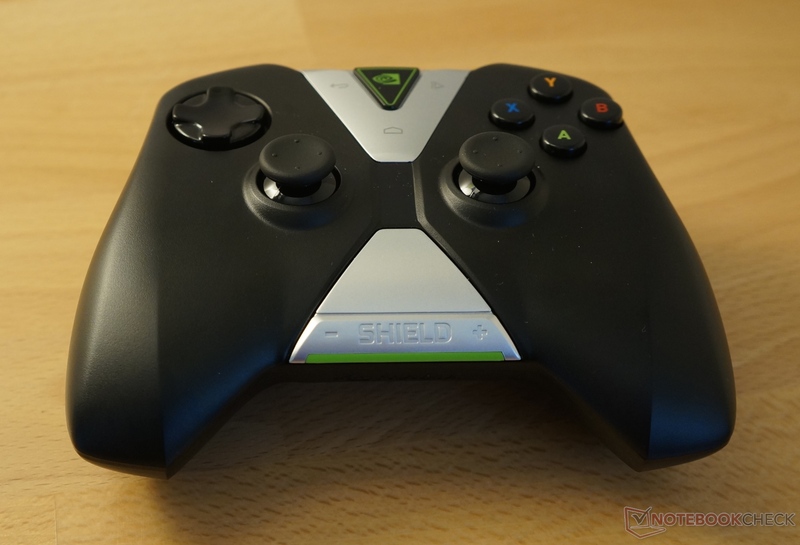 Details about this can be found in the review of the Shield handheld. 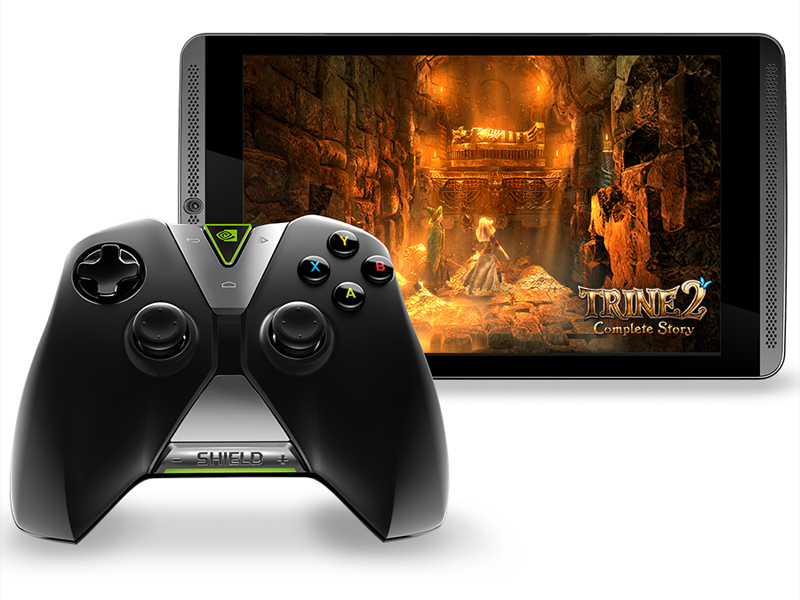 It is even possible to stream PC games on the Shield tablet in conjunction with a current GeForce GTX graphics card. The user can sit comfortably on their couch and enjoy demanding PC games on a TV set via HDMI and the optional wireless controller (even in 1080p owing to Console Mode). Bluetooth keyboards and mice are also supported, making the user independent of the controller. GameStream compresses the image according to the connection speed (it functions best with a USB-LAN adapter). Many games are automatically started in 1280x720 pixels to reduce the input lag. Our experiences were overall positive. Although compressing reduced the quality slightly, games like Call of Duty: Ghosts could be played without lags. However, sometimes we did have to use the PC to stop rebellious games. 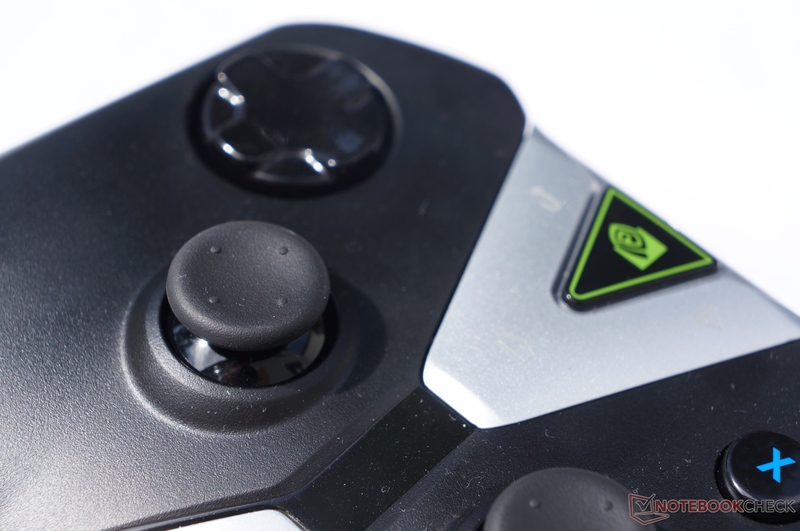 The user can automatically record the on-screen gaming action on the tablet easily via a button in the quick settings. It can then also be directly streamed on Twitch. The user's video taken with the front-facing camera as well as audio comments can also be mixed into the stream automatically. This functioned exceptionally well in the test with Real Racing 3. Gameplay remained smooth, and the front camera picture and recorded sound via the microphone were transmitted impeccably. Since no fan for cooling is installed in the Shield tablet, there is no fan noise even under maximum load. However, a quiet noise from the transistor or something similar can be heard in very quiet surroundings and when an ear is placed close to the tablet. We had some doubts about the surface temperatures in view of a quad-core Cortex A15 with 2.2 GHz and a 192-core Kepler graphics. According to Nvidia, the integrated cooling system should be able to discharge a roughly twice as high TDP than "usual." The Shield tablet only places itself just above the average with an average idle of 30 °C and remains agreeably cool. It is slightly above the average of 33 °C during high processor and graphics load but is still within an acceptable range with a maximum of 38 °C (hot spot on the back). We achieved somewhat higher temperatures in our throttling test (see below) and Portal, where the device heated up to 43 °C and 45 °C respectively. The more demanding graphics in these scenarios stress the K1 considerably more than the Stability Test. The internal sensors recorded a battery temperature of 38.5 °C in the load test, which is also uncritical. Throttling is normally an issue for small, fan-less Android devices with strong SoCs. Most can only maintain the maximum performance for a short period, only to then lower the clock rates of both the graphics card and processor due to temperature limits. We can give the all-clear signal for the Shield tablet. Even after running 3DMark Unlimited 10 times consecutively, the Tegra K1 still reached a similar rate as the first time. The CPU also stably clocked at 2.2 GHz after 15 minutes in the Stability Test. The installed stereo speakers are located beside the screen and radiate their sound directly toward the user. There are additional "bass ports" for lower frequencies on the sides. Although the speakers nosedived to below 300 Hz, they still made a good impression in the test. Their output is a bit treble-heavy, but still considerably more linear than, for example, in Acer's Aspire E5-571G, which is a full-blown, 15-inch laptop. 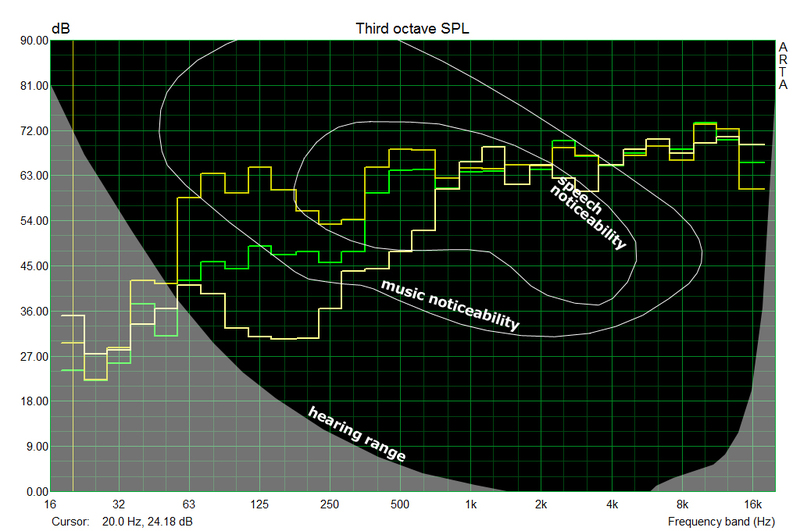 Pink noise frequency diagram of the installed speakers from a distance of 15 cm. 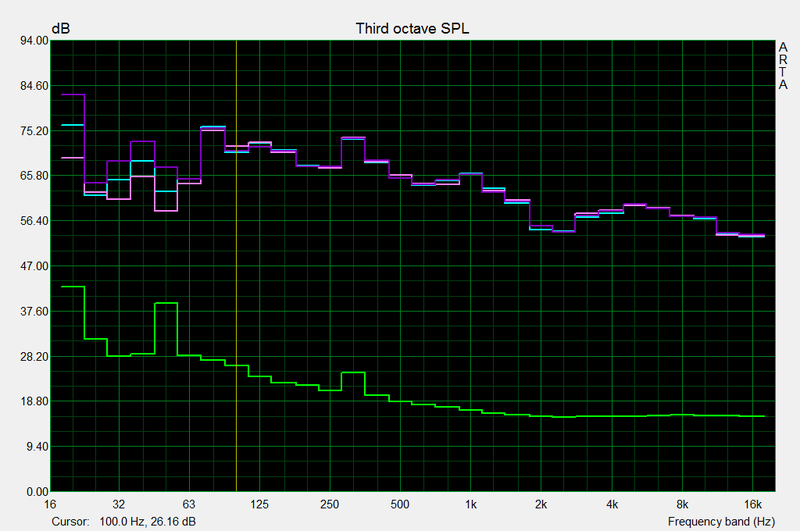 Virtually no bass, but a relatively linear playback of above 300 Hz. 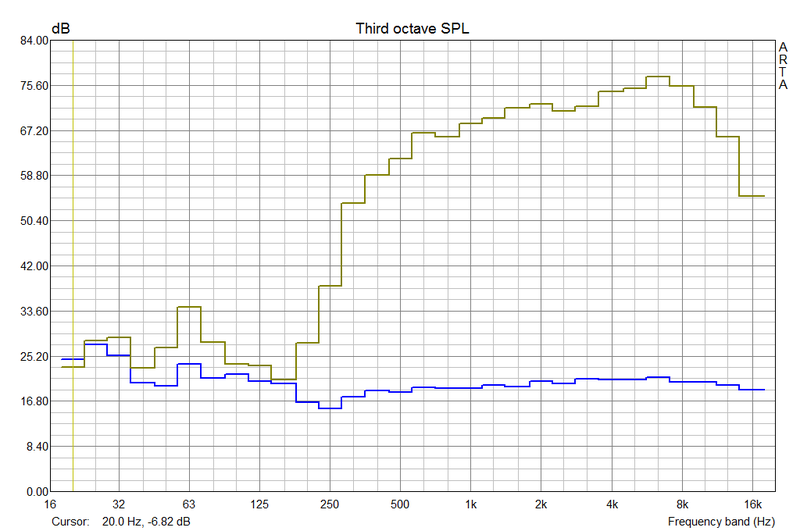 Hercules XPS 2.100 with subwoofer (yellow), without subwoofer (green), ThinkPad T440 (80% volume, yellow). For comparison: Full-blown 5:1 home cinema system with Magnat Vintage 550 and different subwoofer levels. We measured the power consumption between the included power supply and outlet with a fully charged tablet. However, the recorded rates sometimes varied clearly depending on the app. We observed rates ranging from 4 to 5.7 watts during load. The battery was occasionally also drained so that the load rates might not be absolutely comparable. Compared with the Shield console, the idle rates are considerably higher. This is surely due to the larger and higher resolution screen. The average load consumption of 3.6 watts is lower, but that of the maximum load is much higher with 8.4 watts. 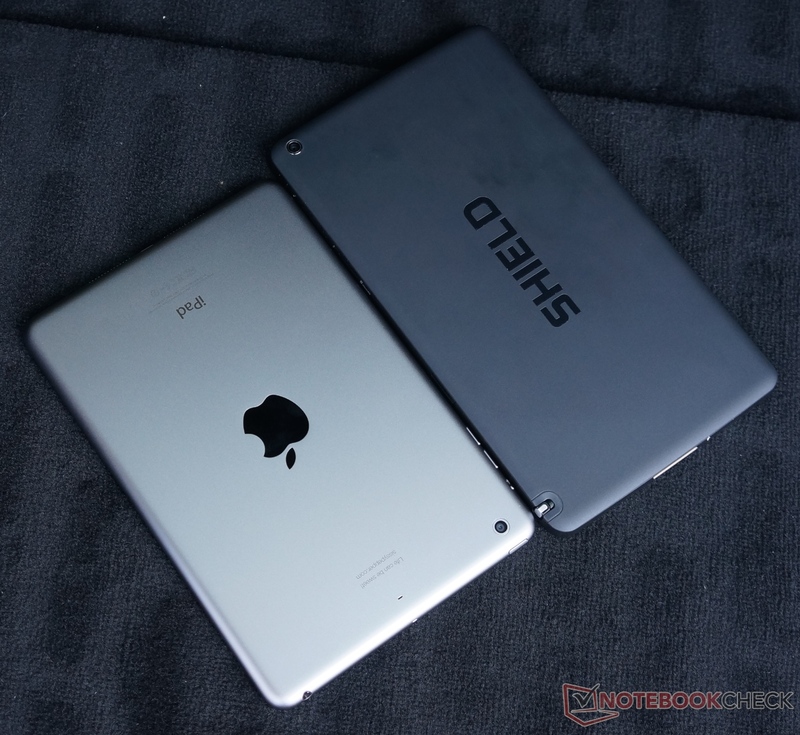 The power consumption is just over the average in the category comparison of 8-inch tablets. The Shield tablet is surprisingly modest particularly during load. However, we are skeptical about that because the battery is sometimes drained. The relatively small 20 Wh battery, of course, slightly limits the runtime. However, the battery has gained almost 5 Wh compared with the Tegra Note 7 based on Tegra 4. Nevertheless, the Shield tablet cannot match it in either the idle or load test, which is likely due to its higher resolution screen. Even the Shield handheld does not have to be recharged quite as soon, but it also has a 28.8 Wh battery (+46%). The Shield tablet is located slightly below the average of all 7 and 8-inch tablets that we tested in the past 24 months. The Tegra K1 apparently only consumes considerably more than its contenders during load. When the rates are put in relation to the battery capacity, the efficiency in both the idle and Wi-Fi test is above average (idle: 43 vs. 28 min/Wh; Wi-Fi: 17.6 vs. 15 min/Wh), but a bit under average during load (6.5 vs. 7.2 min/Wh). Nvidia offers various profiles in the settings for limiting the K1's power consumption and performance. Besides that, it is also possible to set the number of used processor cores, the maximum speed, and a frame-rate limit manually and thus improve the battery runtime. We ascertained a runtime of 4 hours and 43 minutes by playing GTA 3 at a practical rate. Nvidia's specified 6 hours are likely feasible when using the above-mentioned profiles and a reduced brightness. The included power supply needed almost 3.5 hours for completely recharging the battery in the test (the first 50% in 1 h 40 min while the tablet was off). 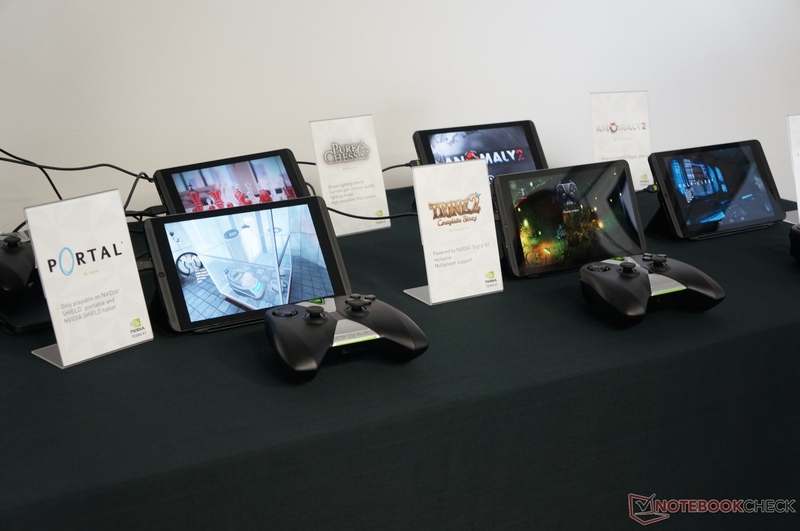 Nvidia has managed to create an outstanding Android gaming tablet with the Shield tablet. The performance of the Tegra K1 is doubtlessly impressive, and it is perfectly fit for the future. 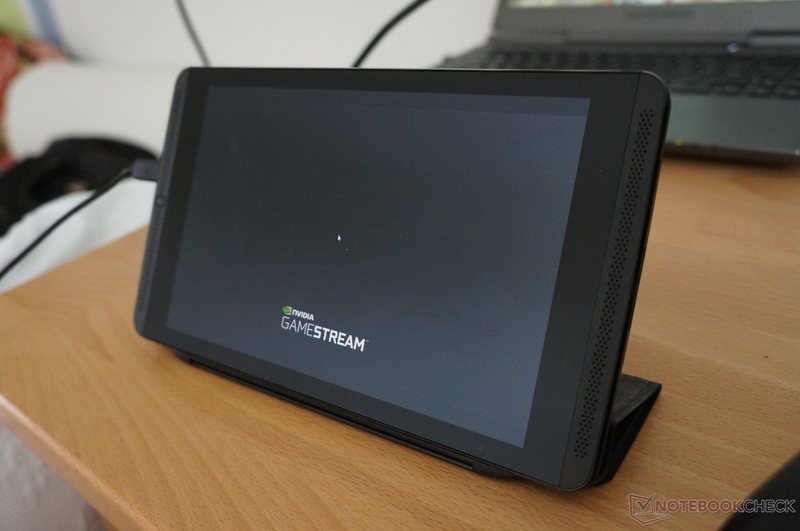 We also very much liked the additional features, such as GameStream, Twitch streaming and DirectStylus 2. 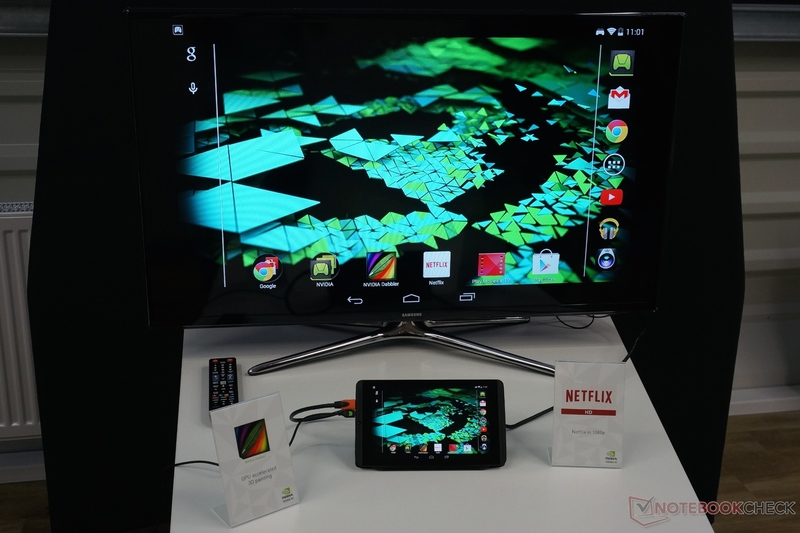 Android 4.4 comes in its appealing native look, and Nvidia promises an update to Android L at a later date. This is very plausible because the Shield handheld was permanently provided with updates. The device's mid-range price point is noticed in build and choice of materials. 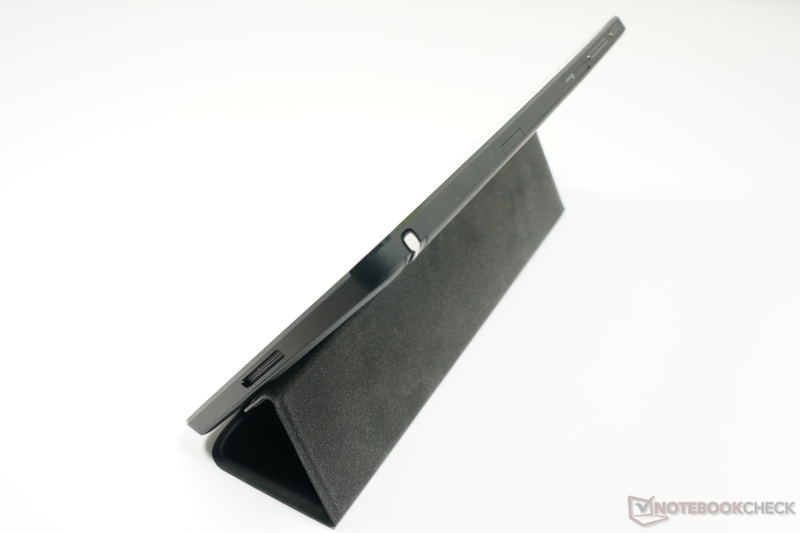 The surfaces are somewhat susceptible to scratches, and the build of our review sample was not perfect. This is, however, the biggest point of criticism. 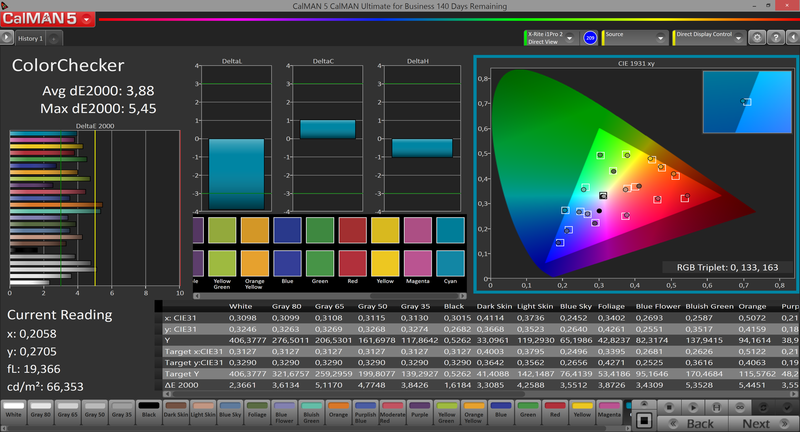 The screen has a pleasantly high resolution, and its colors are pre-calibrated. Only the reproducible color space is slightly limited, but that will hardly bother gamers. In terms of price, the tablet is located in the premium sector with a list price of 299 Dollars. It fits in very well there due to its outstanding performance. In case the GameStream feature is to be used, an additional 70 Dollars Euros should be invested for the wireless controller. Visible graphic errors in Deus Ex (Android). Not reproducable by Nvidia. 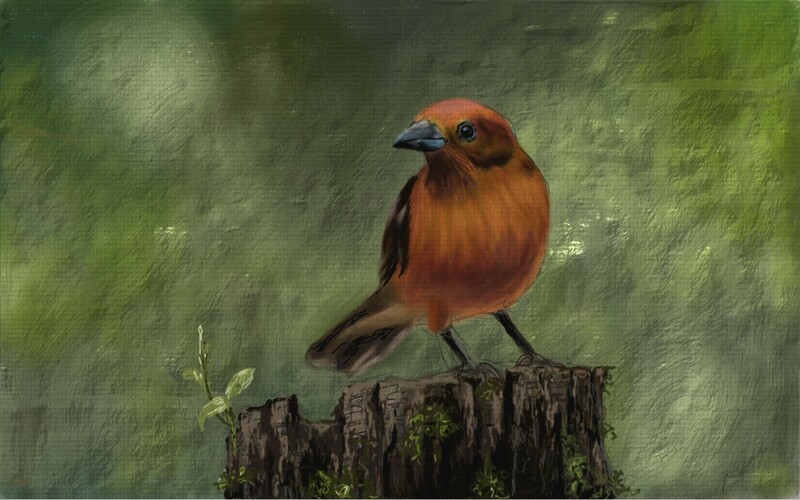 Awe-inspiring oil paintings and water color pictures can be created with the included Nvidia Dabbler and DirectStylus. War Thunder for Android is also to be available for the Shield tablet. 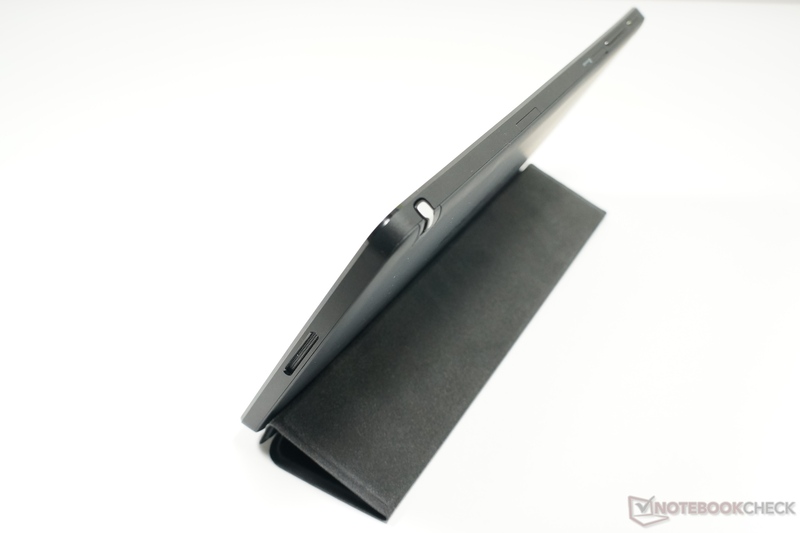 The magnet for the optional cover is strong enough to even hold the tablet. 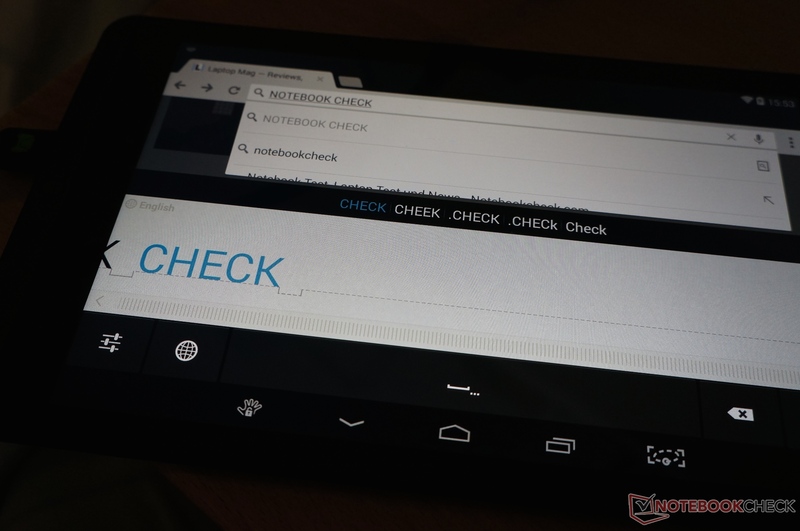 Handwriting recognition in form of the Android keyboard. GameStream occasionally got hung up on this background image, for example, when a game was not closed properly or Windows pushed itself to the front. Recording the on-screen game action or Twitch streaming can be enabled at any time via quick settings. Even the front-facing camera and microphone can be mixed in easily. Unfortunately, the SD-card slot cannot be used with the fingers. All ports are on the upper edge. The very accurate touchscreen even detected 10 fingers easily. 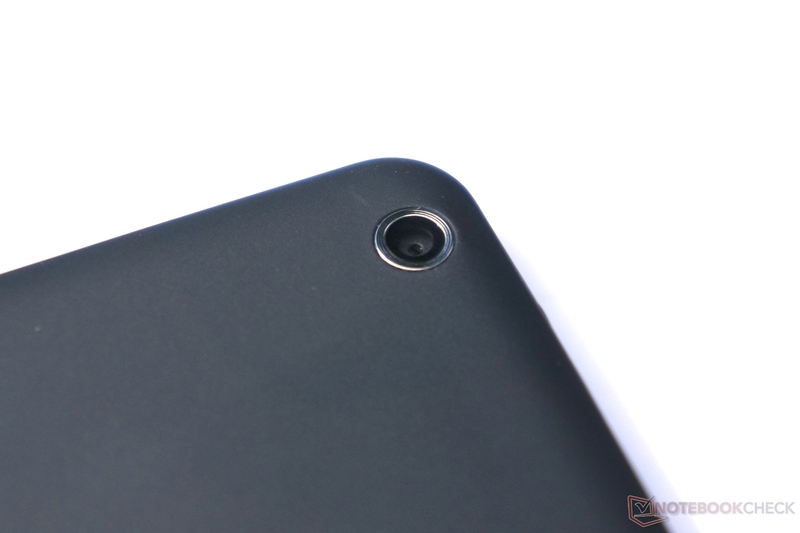 The 5-megapixel rear-facing camera has auto-focus and is more useful for taking snapshots. 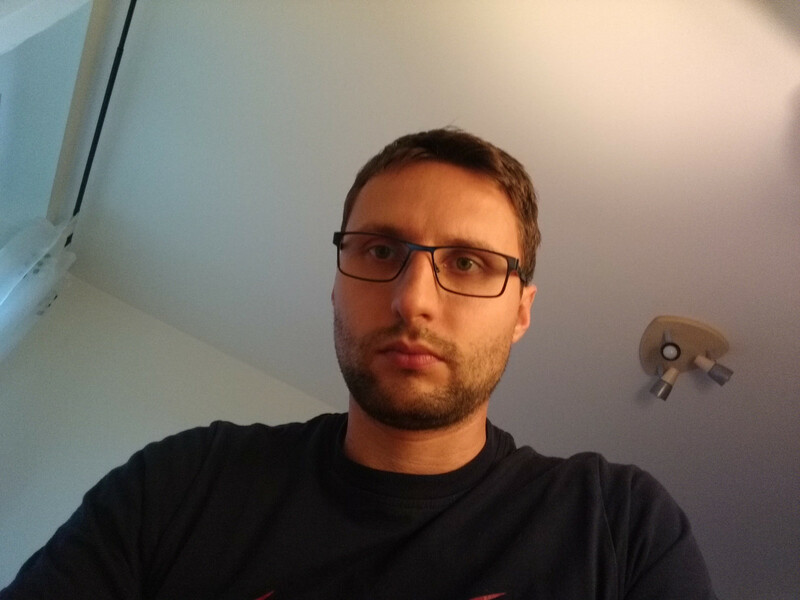 The front-facing camera, also with 5 megapixels, is intended for webcam tasks such as Twitch. Unfortunately, the hand often covers it when playing in landscape mode. The DirectStylus 2 pen can be inserted directly into the device. 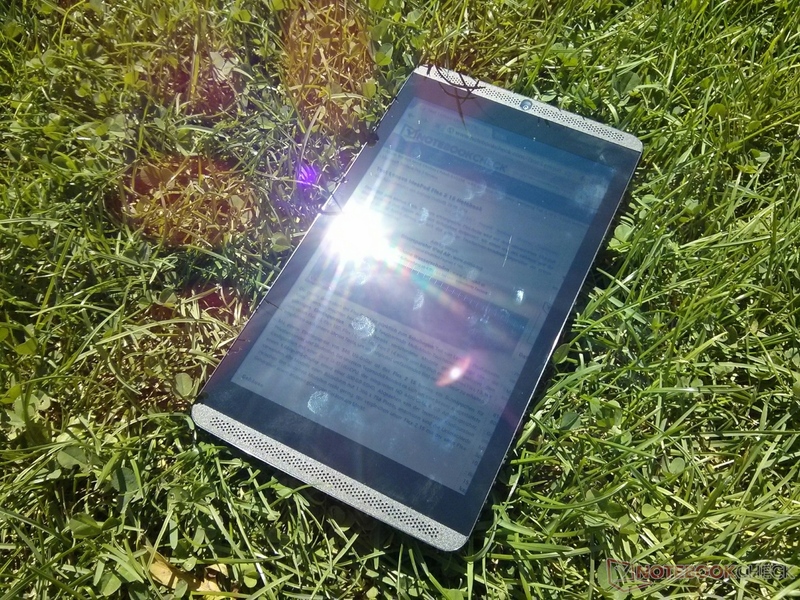 The tablet can also be used outdoors, owing to its high maximum brightness. 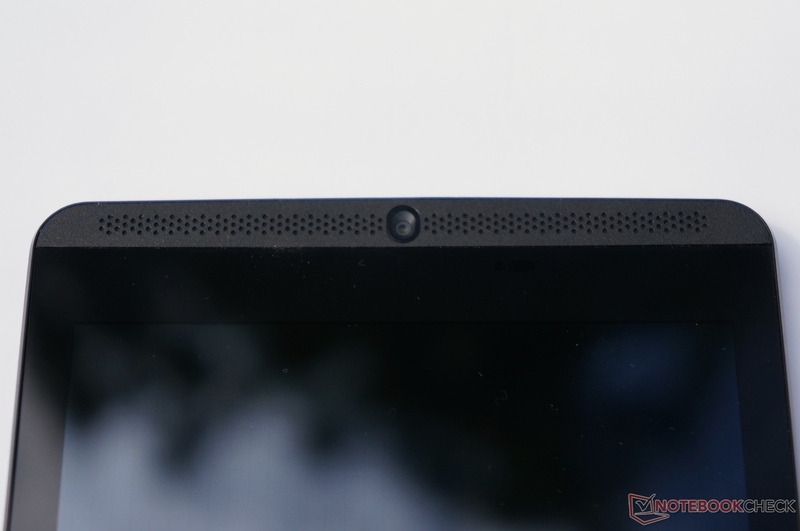 The matte back provides a pleasant haptic feedback. USB OTG functioned with both a USB stick and keyboard/mouse in the test. The preloaded game Trine 2 (full version) offers almost console quality, and it can be controlled perfectly with the wireless controller. 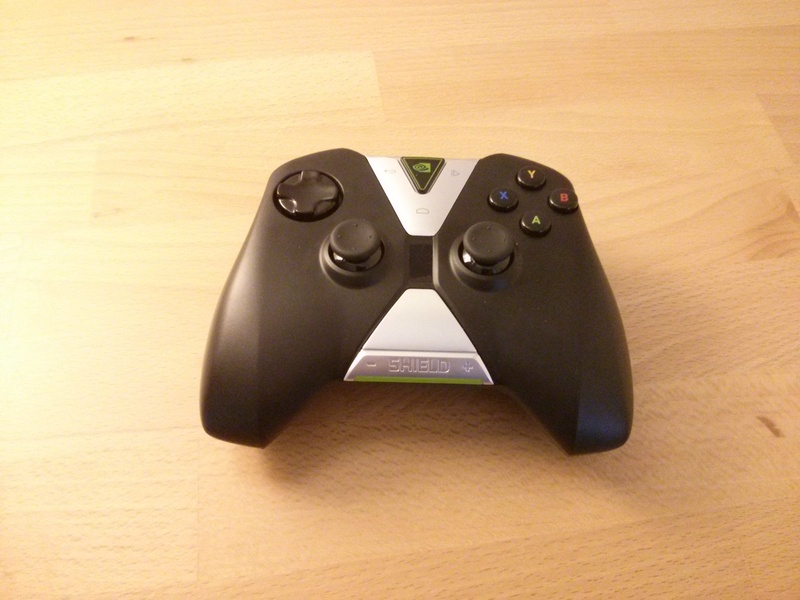 The optional Shield controller convinced us in the test, but it is not cheap. 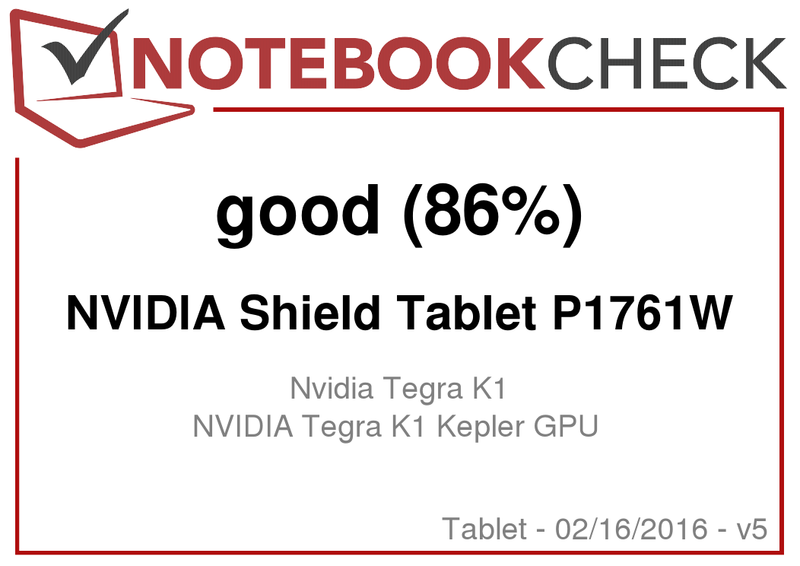 The great performance of the Tegra K1. The innards would fit better into the casing of the iPad Mini. A deep scratch in the screen and cracks in the casing's bezel after using the review sample for only a few weeks. 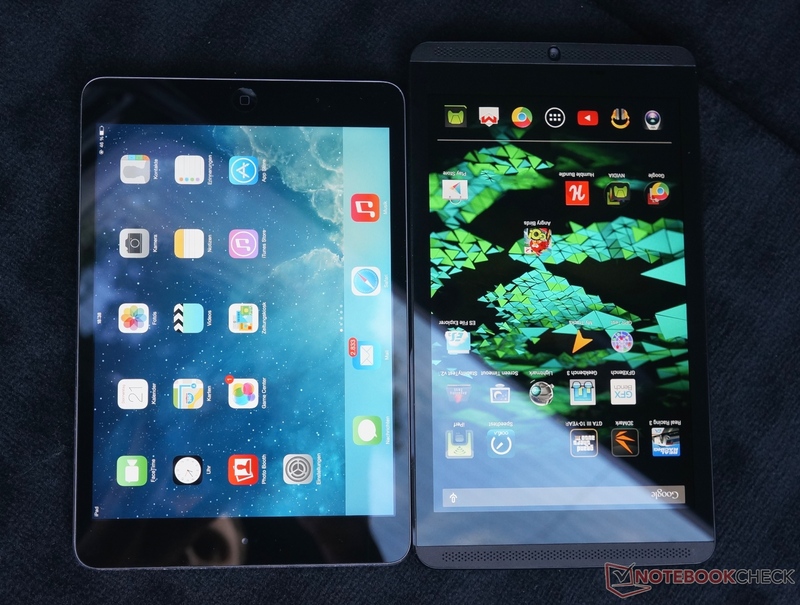 Apple iPad Mini Retina, the upcoming generation of the Shield handhelds (test with Tegra 4) featuring Tegra K1, speedy, 8-inch Android tablets like Samsung Galaxy Tab S 8.4, Samsung Galaxy Tab Pro 8.4, LG G Pad 8.3.